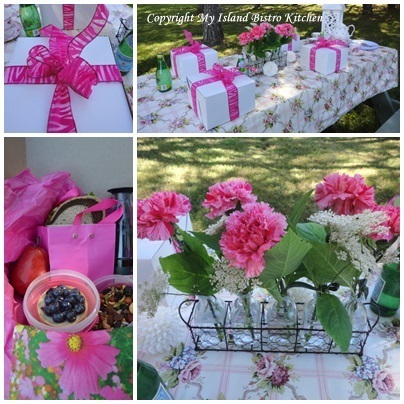 I’ve had a great summer of picnics this year! Haven’t gone on this many picnics in many years. I had forgotten how much fun and relaxed al fresco dining can be. This posting will feature my Labour Day Weekend Picnic but, first, a little trip down memory lane. 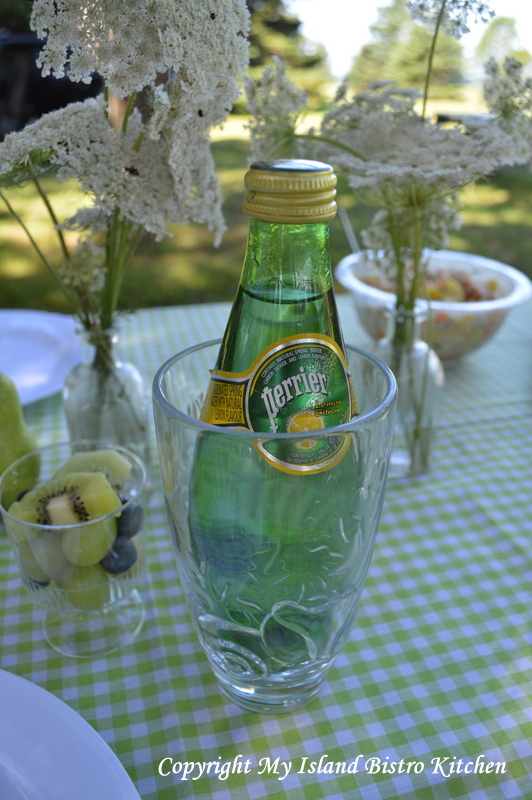 One of my favorite summertime memories involves a picnic. I was visiting a neighbour playmate and we were probably about 8 or 9 years old. We took a notion one hot summer day that we would have a picnic by the little stream across the road from my friend’s place. 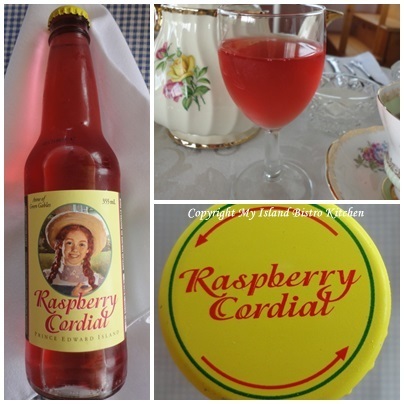 The two of us stood by the friend’s mother at the kitchen counter as she whipped up some gourmet peanut butter and jelly sandwiches, placed them in an old tin school lunchbox, filled a thermos with Kool-aid (anybody remember Kool-aid? ), and sent us off on our big adventure to the picnic by the stream. Off we went across the little country road, down through the cow pasture to a little stream which, at its deepest point was probably all of 4″ or 5″ deep. We situated ourselves, had our picnic, and probably returned to the house all in the span of about 15 minutes, no doubt ready for another activity! Yet, we had been on a picnic adventure and made a memory. That was back in the days when kids played outside all day and found numerous ways to amuse themselves and none of them involved cell phones or computers. I will admit my picnic adventures have progressed and become a bit more sophisticated. 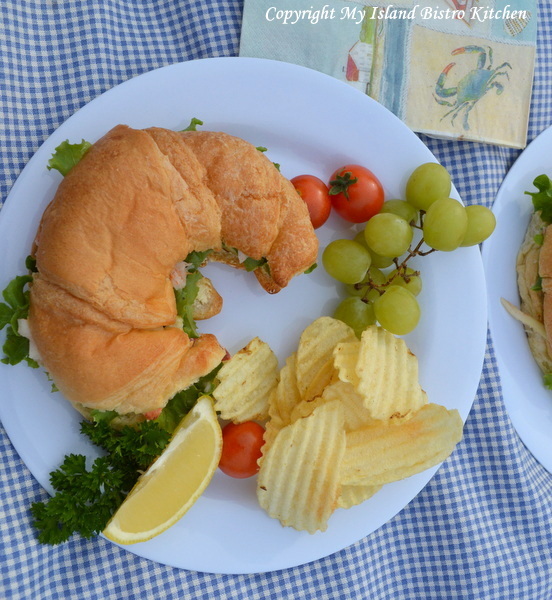 There are so many options for picnic foods, particularly when it comes to sandwiches – there are traditional sandwiches with any number of different kinds of breads as options, wraps, baguettes, different kinds of rolls, bagels, etc. For my picnic by the sea today, I have chosen croissants. They are tasty and have a nice, soft texture. Because I live near the water and close to a small fishing village that has a fresh seafood market open daily in the summer, lobster was a logical choice for a croissant filling. The late summer fishing season has opened in Victoria-by-the-Sea on the south shore of PEI so buying lobster at the seafood market means the lobster is really, really fresh. 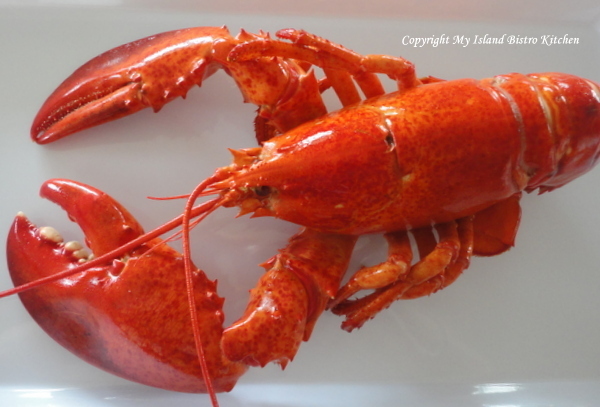 Take a look at this 1 1/2+ pound lobster that I took home with me to make the filling for the croissants! 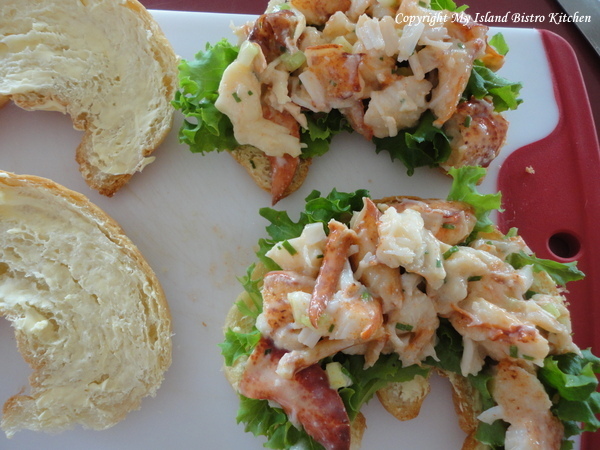 I don’t really have a defined recipe for lobster filling for sandwiches or croissants. 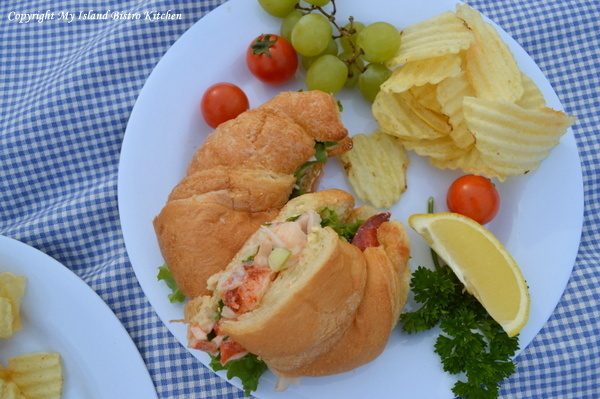 I chop the lobster meat into fairly large chunks as I like to see good-sized pieces of lobster in a lobster roll or croissant — no mashed-up or shredded pieces of lobster meat will do for me! I add a bit of celery, some pepper, some fresh chopped chives, a splash of fresh lemon juice, and some homemade mayonnaise – just enough to hold the meat together and give it flavour. That’s it, nothing more as I don’t like anything that detracts from that rich lobster flavour. 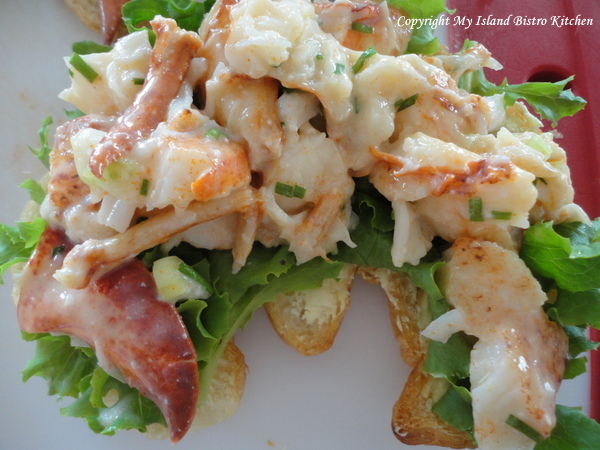 I buttered the croissants, added a bed of fresh lettuce from our garden and then heaped on the lobster filling. Yes, it was very yummy! 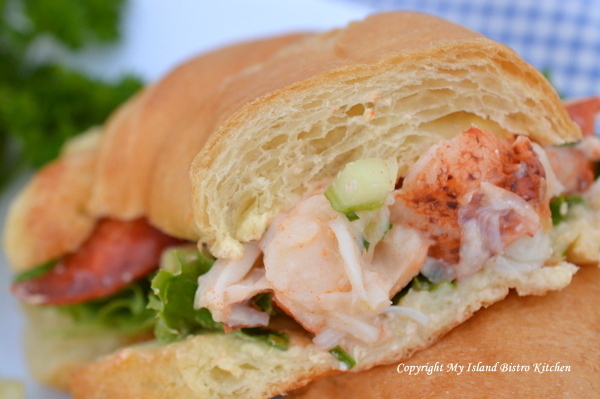 And, this is what I mean about wanting to see nice big pieces of lobster in the sandwich. Isn’t it mouthwatering and colorful! Add some potato chips and picnic fare doesn’t get much better than this, particularly when the picnic location is beside the water. With something as special as lobster, the menu does not have to be extensive. Let the lobster star all on its own! My August Cookie of the Month was the chocolate drop cookie. They were dessert. 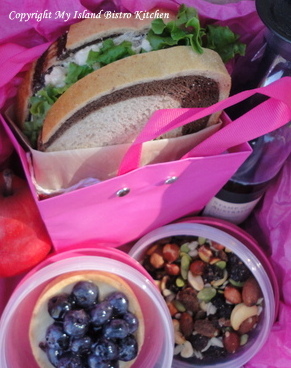 I added some fresh fruit – this time, some green grapes – and the picnic basket was ready to go. 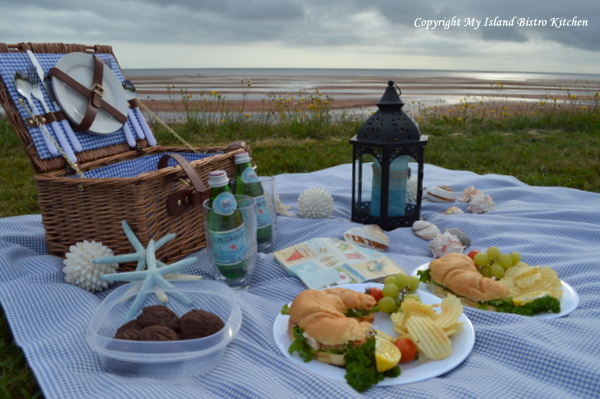 I always like to take along some props to dress up the picnic spread, regardless whether it is at a picnic table or on the ground as is the case here by the beach. It doesn’t matter whether I am in my dining room setting a formal table or outside, I like to think of setting the stage for a feast for the eye as well as for the stomach. 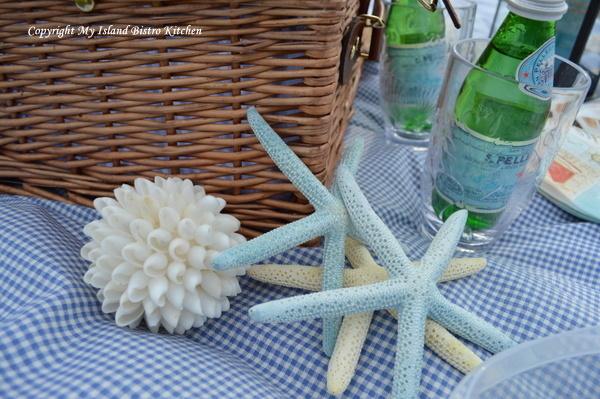 A few props really can make an ordinary picnic a bit more special. 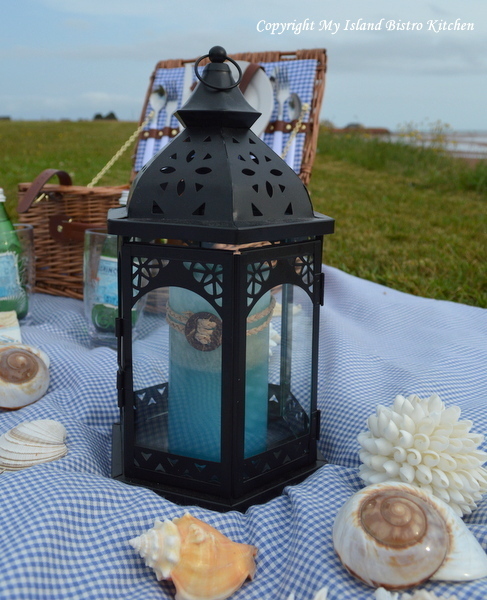 For my seaside picnic, all it took was a blue-checked cloth, a stylish matching wicker picnic basket, a lantern with a blue candle, and some seashells and starfish, to dress up the dining experience. I love the patterns in the pink-red sandbars on PEI. Our Island beaches are extraordinary – on the south side, they tend to be more the pink-red color you see in the photo below while, on the north side, the sand is more of a soft pink color. This is definitely a dining room with a water view! However, the sky began to look somewhat ominous so we thought we had better hurry up and eat in case a rain shower came along and spoiled the picnic. 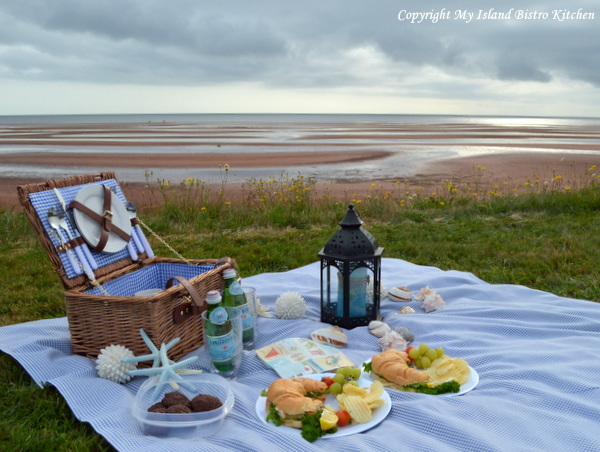 I hope you have enjoyed some of the scenes from our seaside picnic that featured PEI lobster. Enjoy your Labour Day weekend. I have a keen interest in where the food I eat is produced. Recently, I visited Burns Poultry Farm in Freetown, PEI, to find out about egg production. 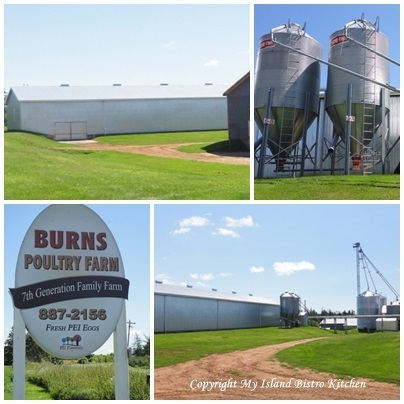 There are five active registered egg-producing poultry farms on PEI, one of which is the Burns farm. Before seeing the egg grading process in action, I sat down with Wendy Burns to find out about their poultry farm. 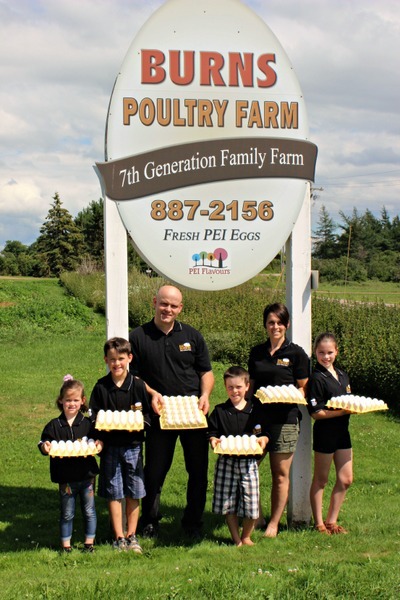 Wendy’s husband, Nathan, is a 7th generation egg farmer on PEI so the Burns family knows a thing or two about egg production! Wendy and Nathan bought the poultry farm from Nathan’s parents in 2001. Wendy remarks that, from the time he was very young, Nathan had a keen interest in poultry farming and knew what his future vocation was going to be! Wendy manages the office, the accounting, and payroll while Nathan tends to the feed formulations, egg production, and egg grading. The couple met while attending Nova Scotia Agricultural College, from which they both graduated – Nathan from the Agricultural Engineering Program and Wendy with a Bachelor of Science in Agriculture. In addition to being parents to four active growing children, this couple has transformed their egg farm into a very efficient family business. They have expanded existing barns; built a new barn for the laying hens; added a bigger generator with an automatic switch that kicks in if the farm is without power for 5 seconds; expanded their cooler capacity; invested in a new egg packer that packs eggs each day from their laying barns; upgraded their water systems to provide ozonated water for the hens which aids in their digestion; purchased a Pulsefog machine to disinfect the barns faster and more efficiently; and installed a state-of-the-art grading machine into their newly-renovated, federally-inspected egg grading station. The Burns family holds quota for about 32,000 laying hens and they have three equally-sized barns that house the flock. With over 90% of the hens laying one egg per day, it is a lot of eggs to gather. 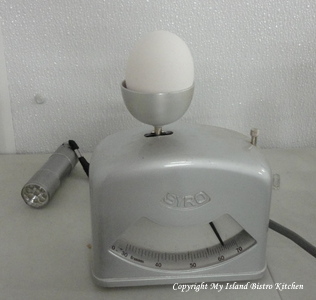 Every time an egg is handled or moved, it increases the potential for damage or cracks. Wendy explains that, with their efficient collection system, it is possible for a hen to lay an egg and the egg not be touched by a human hand until the consumer takes it out of the carton or the restaurant chef cracks the egg on the grill. 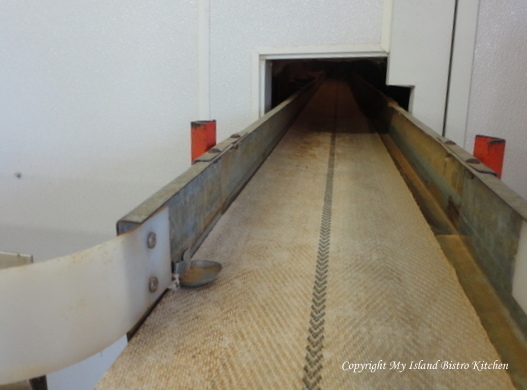 This is because the Burns’ have an “in-line” system that transfers the eggs from the barns via a conveyer belt to the grading station. The system the Burns have installed is all computerized so it allows the eggs to come from the barns, be counted, washed, candled, graded, packed, and in their cooler in approximately 15 minutes. Now, that’s what I call farm-fresh eggs! I wasn’t able to go inside the barns where the hens are housed so I did not see any of the laying hens. This is because of their on-farm food safety program and biosecurity protocol. Wendy says “the goal is to maintain a consistent, undisturbed environment for the birds because deviations from their normal habitat could affect their well-being and, consequently, egg production”. On a daily basis, only Nathan and two workers are permitted inside the barns. A walk-through of each barn is done twice per day and each row of hens is checked to ensure the birds have enough water and feed and that their environment is comfortable. Nathan also checks the barns each evening after all the feedings are finished to ensure all is well before lights out. Wendy explains that the only other person permitted to enter the barns is the inspector from the Egg Farmers of Canada. “The inspector makes several site visits each year where the birds are counted and swabs are taken for testing to ensure there are no diseases present”, explains Wendy. The inspector also audits their Start-Clean/Stay-Clean records to ensure all protocols follow the guidelines of their On Farm Food Safety Program. Wendy was able to tell me about their flock. At the time of my visit, the hens were all one breed – Lohmanns. They all lay white eggs but Wendy says that the farm placed some brown egg layers in the grow barn last cycle and those hens will begin to lay brown eggs in September. The highest expense in the operation is the feed. The Burns monitor feed consumption to ensure the hens are getting adequate nutrition. The hens need different levels of nutrients, such as calcium and protein, at different ages. This ensures bird health is maintained and the hens produce the best quality of eggs possible. It takes 18-19 weeks for a chick to become a laying hen. The chicks arrive in batches of about 12,000, two or three times a year. Wendy says that it is always an exciting day on the farm, as you can imagine, with four young children seeing 12,000 baby chicks arriving all at once! The Burns have three production barns that house the hens, each containing a flock of hens of a certain age – i.e., 20 weeks apart in age. This means their farm can ensure a steady supply of high-quality fresh eggs for customers year round. I asked Wendy what determines the different sizes of eggs. She tells me that it is the weight of the egg that will determine if it is a small, medium, large, or extra large egg. Younger hens typically lay smaller eggs and the average egg size increases as the hens age. 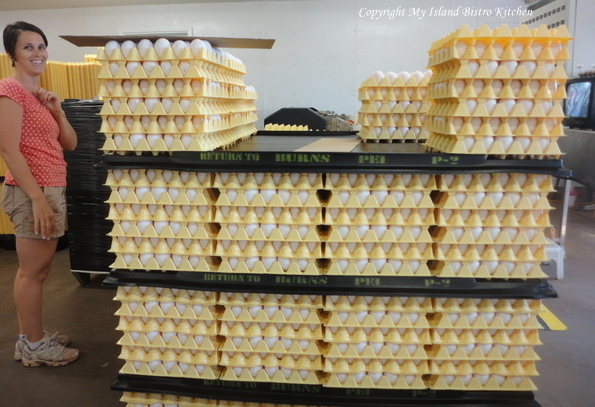 Generally, medium, large, and extra large eggs are packed for the fresh shell egg market while the other sizes are sent off for industrial use – for example, dried for cake mixes, frozen, liquid whole egg, or whites only. No eggs, regardless of size, are wasted. Eggs are a supply-managed commodity. The egg industry is heavily regulated and the Burns must comply with the regulations of the Egg Farmers of Canada and the Canadian Food Inspection Agency, in terms of housing the hens, cage density, sanitation programs, welfare of the birds, and pest control. 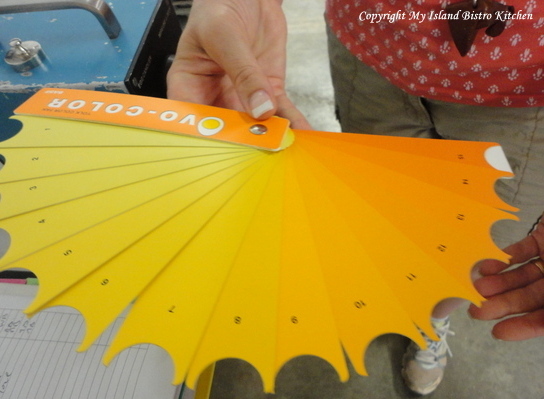 There is a lot of record-keeping involved in the operation of an egg farm and egg-grading station. All food safety-based programs are in place to ensure the safest possible supply of eggs for consumers. Wendy tells me that the “Best Before” date of graded eggs is six (6) weeks from the date they are graded. 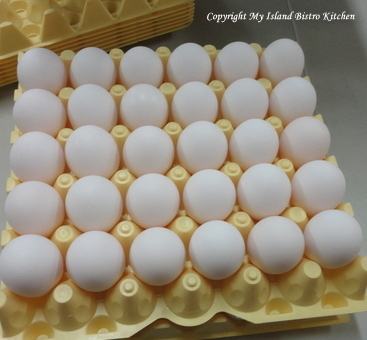 She also explains that washing the eggs, which is an obvious necessity, reduces the shelf life of eggs as it removes the natural sealant that the hens leave on the eggs when they are laid. I asked Wendy what their biggest challenge is as egg farmers. She says she has concerns over the possibility that, at some point, supply management of the egg industry could be disbanded. This is the Canadian system that regulates quota and, consequently, egg production. If that was to happen, anybody could build a barn and start large-scale egg production, with no food safety procedures, no testing protocol, or no rules. As Wendy explains, “currently, registered egg producers pay levies that pay for their food safety protocols, testing, and ensure there is no surplus of eggs on the market which could impact negatively on their chance of a fair return for their investments and hard work.” As Wendy says, “being a regulated producer is a big investment but it provides stability without relying on government dollars as it is producer-funded”. As for their greatest source of satisfaction as egg farmers, Wendy says she and Nathan work well together and the couple enjoy being their own boss. They like the challenge that comes with no two days being the same on the farm. Wendy tells me she really enjoys the lifestyle of living and working on the farm as it allows her to be home with her children before they catch the school bus and greet them when they return home in the afternoon. 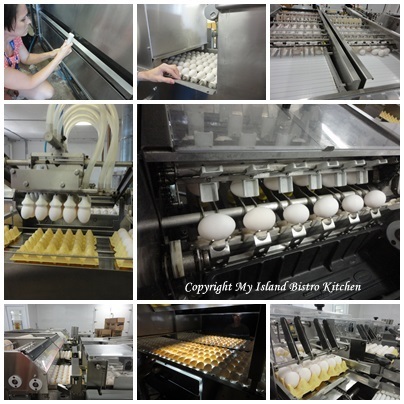 The day I visited the Burns farm, they were busy with their egg grading which takes place once a week. By the end of the day, they would have graded approximately 55,000 eggs for market! 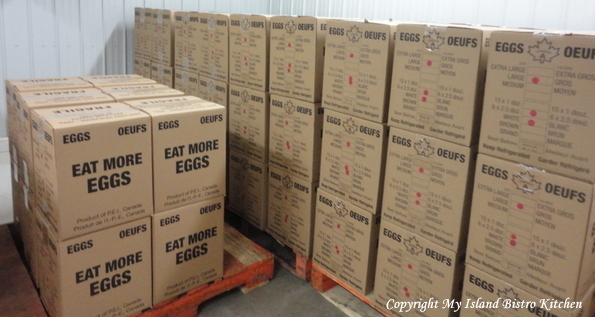 The number of eggs graded is determined by what the farm can sell as graded product. 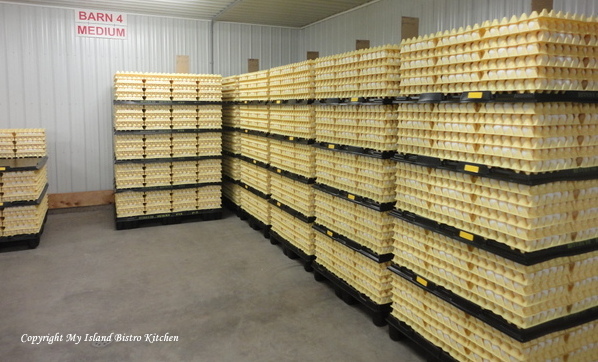 On days when no grading is taking place, the eggs are packed on to plastic trays by a farm packer machine, loaded on to pallets, and refrigerated. Eggs that are surplus to fresh markets are sold as industrial product. The farm employs three individuals full-time on a year-round basis and six individuals on a part-time basis. – egg shells are made up mostly of calcium – the better the quality of egg shell, the less likelihood there will be of cracked eggs. – the color of the egg shell (white or brown) is determined by the genetics of the hen, not by diet. 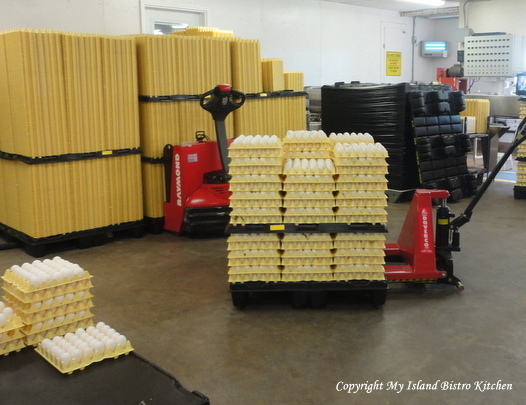 – according to the Egg Farmers of PEI Website, Island egg farmers produced 3,304,300 dozen eggs in 2012 and about 50% of those were consumed by Islanders! That’s a lot of eggs! Nathan and Wendy are marketing their eggs through ADL Foods. The public may purchase the eggs on-site at the ADL Foods Retail Outlet in Reads Corner on Highway 1A in Summerside. 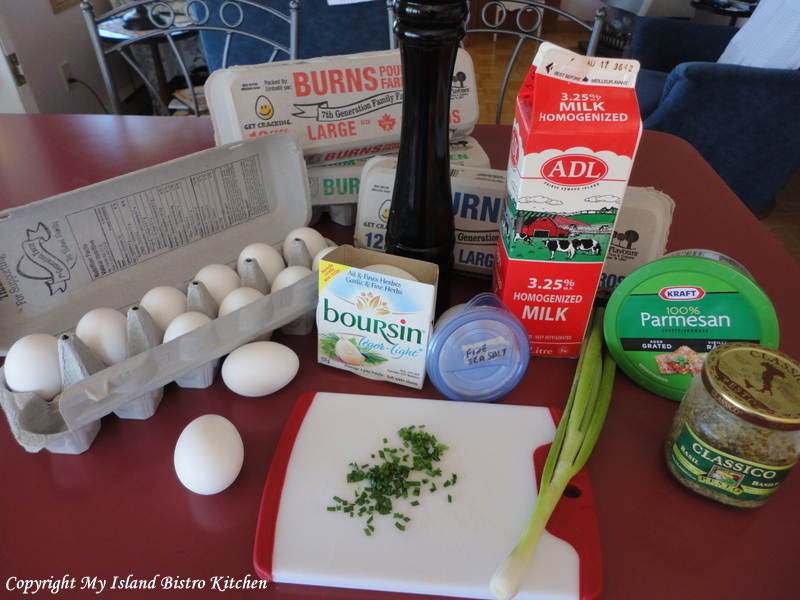 ADL Foods also sells Burns Poultry Farm’s eggs by the box to many Island restaurants so, chances are, if you have eaten an egg at an Island restaurant that gets its eggs from ADL Foods, you may have eaten an egg produced by this 7th generation PEI family farm. 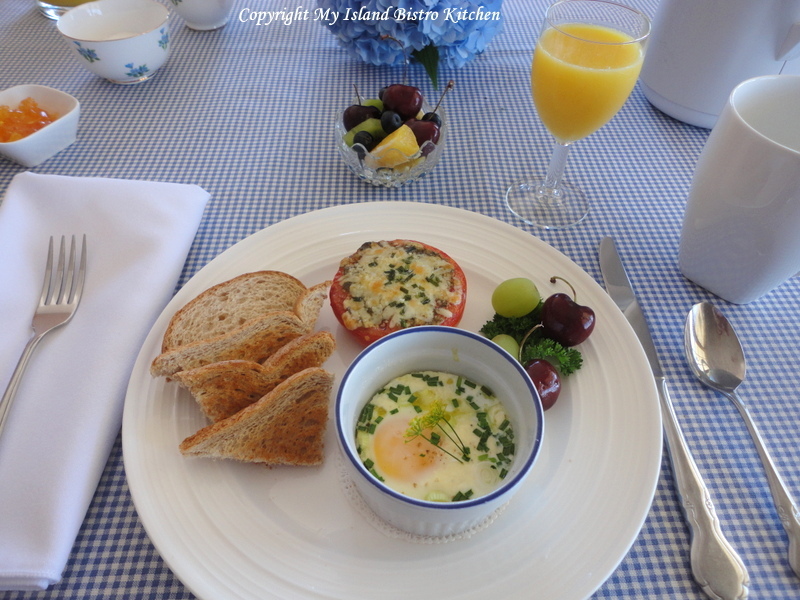 I used Burns’ eggs in the following recipe for Baked Eggs with Basil Pesto and Cheese. Spray two ramekins dishes with cooking spray. Place 1 ½ tsp pesto in bottom of each dish and swirl it around so bottom of ramekin are covered with pesto. Sprinkle 1 – 2 tsp parmesan cheese on top of pesto. 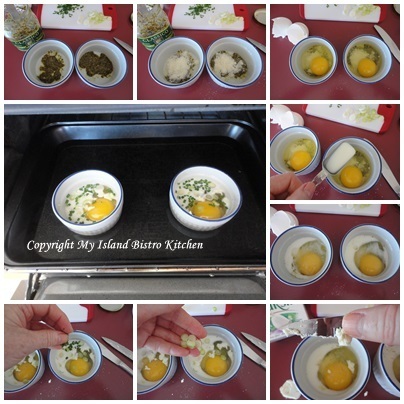 Crack one egg into each ramekin without breaking the yolk. Add 1 tbsp milk or cream to each dish. 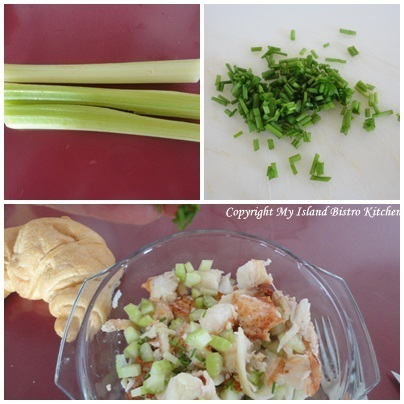 Sprinkle each with sliced green onions and fresh chives. Add salt and pepper to taste. Top with 1 to 1 ½ tsp soft cheese. Place ramekins in oven-proof baking pan. Fill up pan with boiling water until it reaches the half-way point on the sides of the ramekins. Bake eggs for 10-20 minutes, depending on whether you like eggs runny, medium, or well done. 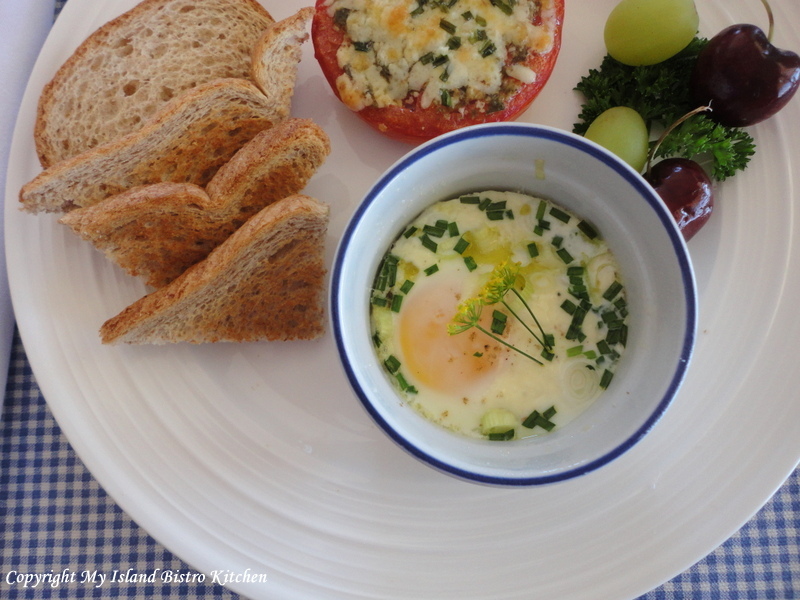 This egg dish is perfect for a special weekend morning breakfast or brunch or even for a light supper. My thanks to Nathan and Wendy Burns for taking time out of a busy day to meet with me and explain the egg production process at their farm. Summer is starting to close in on PEI. The days are noticeably shorter and the daytime temperatures are sometimes dropping to the high teens/low twenties (Celsius). 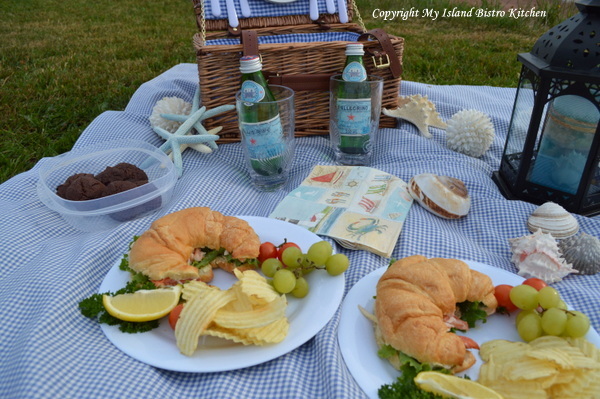 Before everything starts up again in September, the days all of a sudden get more hectic, and everybody tends to go their own way with a multitude of activities and commitments, I thought I would host a girls’ relaxing day out picnic. 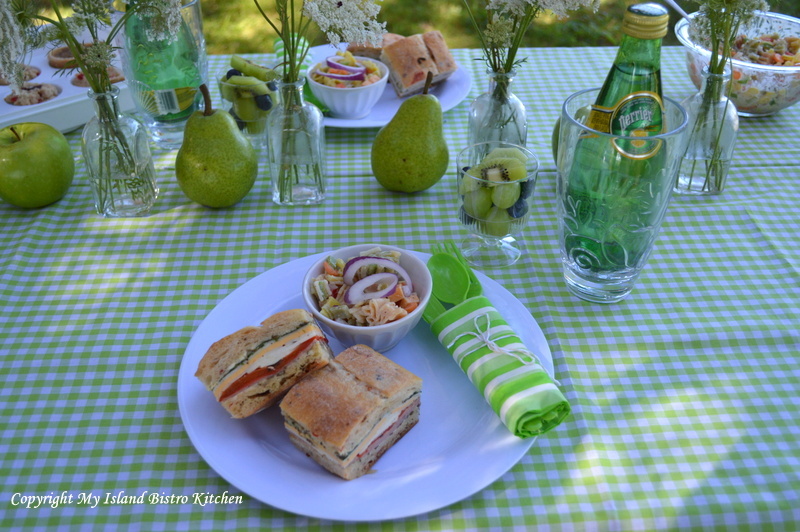 The inspiration for this picnic theme came from the old-fashioned picnic box lunches. 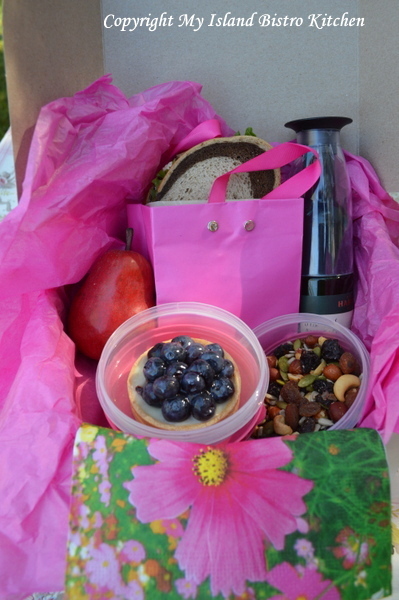 Each guest gets her own box with her individual picnic lunch packed inside. 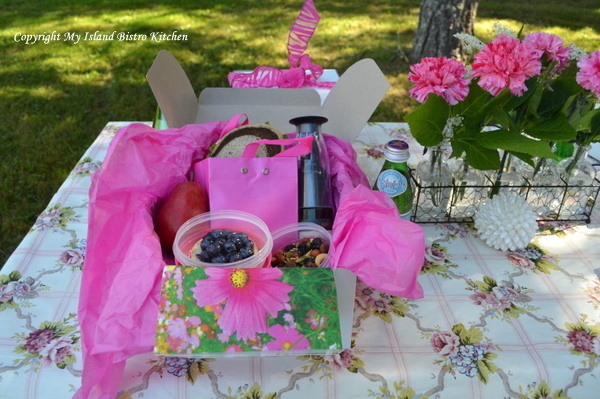 Part of the fun and charm of a picnic box lunch is opening the box to discover what culinary treasures await. So, let’s open one of the picnic boxes to see what the picnic menu is for today. 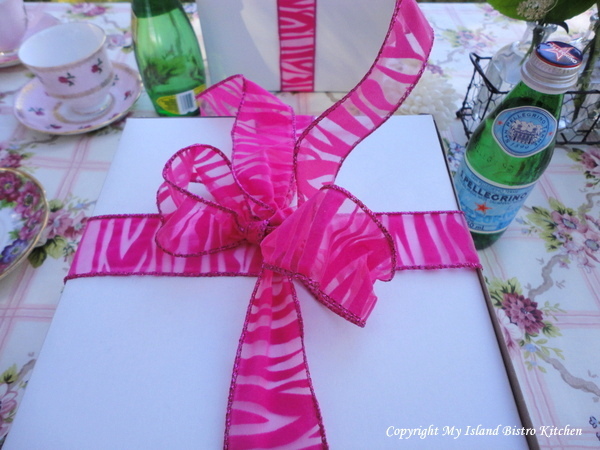 Each box, lined with hot pink tissue paper, contains a Waldorf Chicken Salad Sandwich on Marbled Rye. Packaged in parchment paper and slipped into a tiny gift bag, this sandwich is as much a treat for the eye as it is for the tummy! 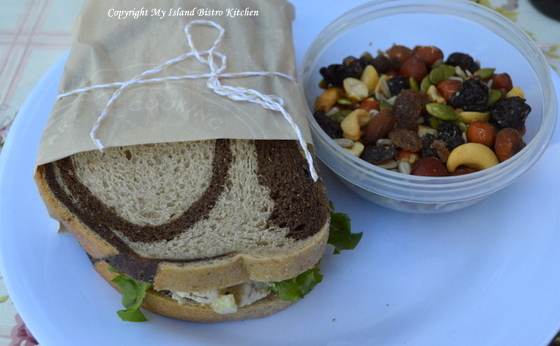 Some munchy trail mix will make a tasty (yet somewhat uncommon) accompaniment to the sandwich. I sometimes like to use different meal accompaniments rather than always the usual potato chips, pickles, salad or traditional coleslaw (although they are always good and tasty options, too). This marbled rye bread is a good, thick density type bread that holds together well so it makes an ideal picnic sandwich bread. It does not need to be thickly sliced – in fact, it is best if sliced rather thinly. As a bonus, this bread gets high marks for presentation. 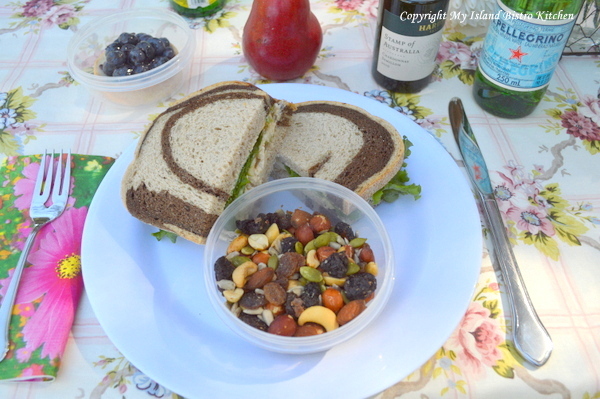 I like to use unique and different breads and rolls for picnic sandwiches because it steps up the presentation factor a notch! 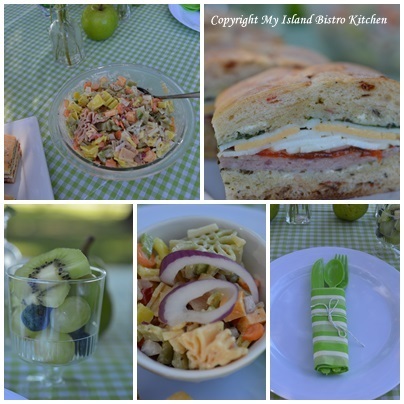 If you have been following my blog entries about picnics this summer, you will find that I have used different breads, rolls, or wraps, each time. 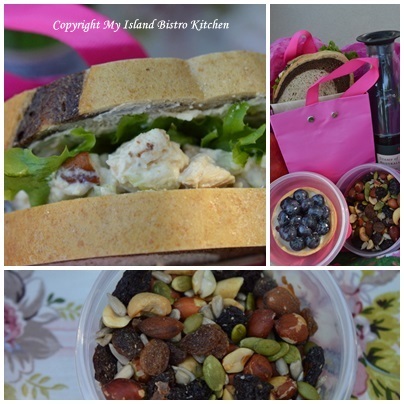 You will also notice that, even though this is a picnic box event, I have included some plates and cutlery for the sake of guest comfort and convenience – the sandwich cuts easier with a knife and on a plate and the tart is less messy when eaten with a fork! 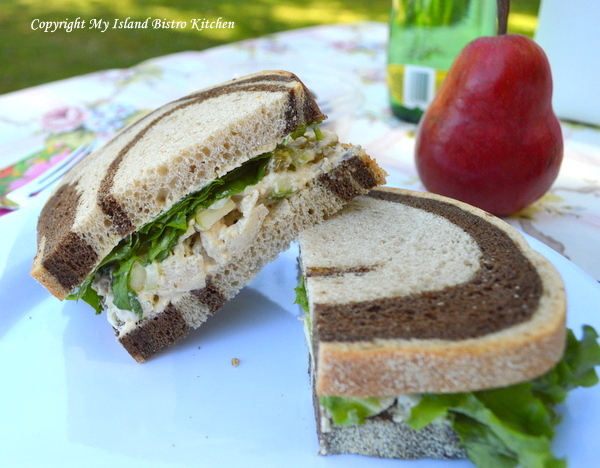 The Waldorf Salad Sandwich is very easy to make. 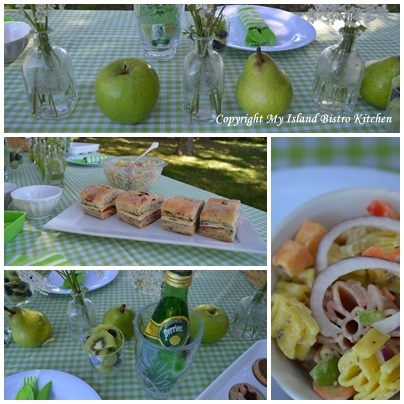 I used chopped cooked chicken and added some sliced green onion, golden raisins, chopped celery, finely diced Granny Smith apple, salt and pepper to taste, and enough mayonnaise to hold the sandwich filling together. 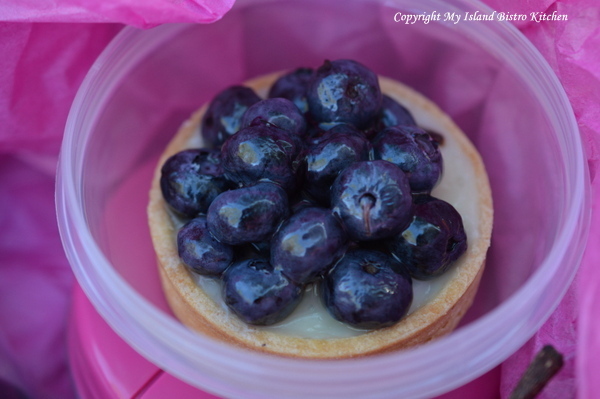 Blueberries are in season right now on PEI so I have chosen blueberry tarts for dessert. These are easy to pack in some small plastic containers I have on hand (which just happened to have hot pink-colored covers that match today’s picnic color scheme). Desserts like this are somewhat fragile so need to be packaged carefully, particularly if travel to a picnic venue is involved. 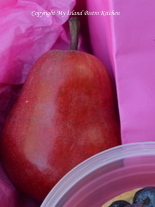 A nice red summer pear will finish off the meal. 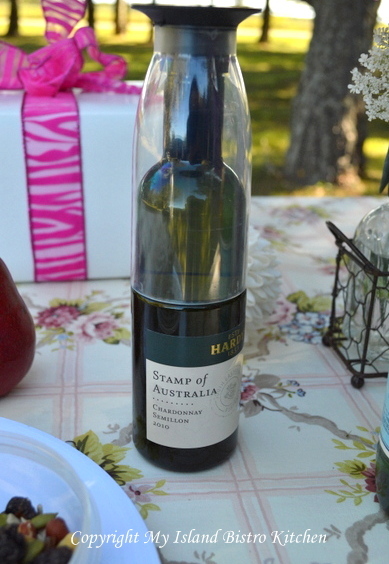 I have also included an individually-sized bottle of Hardys Stamp of Australia Chardonnay Semillon in each box. I love how Hardys have included the convenience of a wine glass right on the little bottle! These small bottles of wine fit perfectly into the picnic boxes. 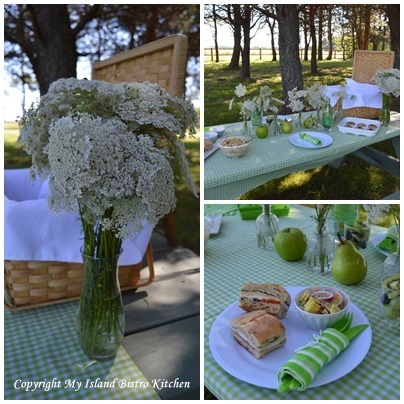 Add a colorful matching napkin and this picnic lunch can be eaten anywhere, with or without a table. 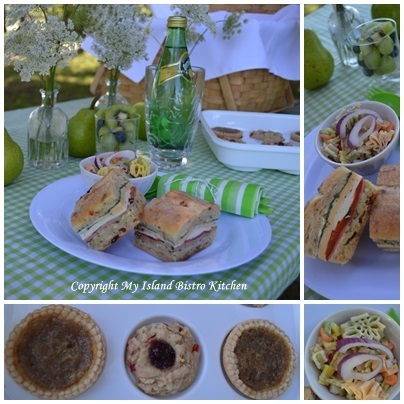 Preparing picnic lunch boxes is a fun and creative way to serve picnic fare. They can be simple or elaborate, themed, and used for any age group by simply varying the menu contents. 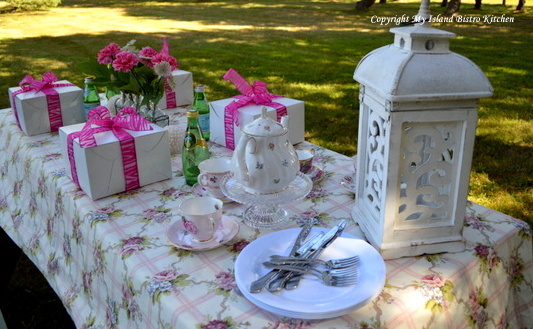 There are so many ways to prepare and host picnics so that guests enjoy the al fresco dining experience. 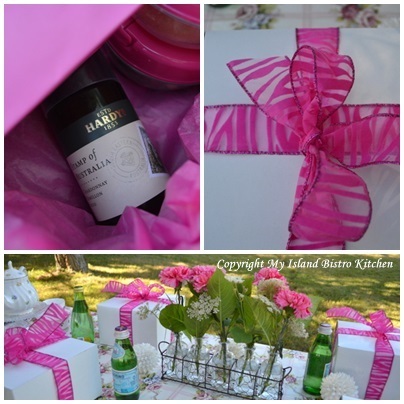 Time to re-package my picnic box and get ready for the guests to arrive on this beautiful sunny late summer PEI day! 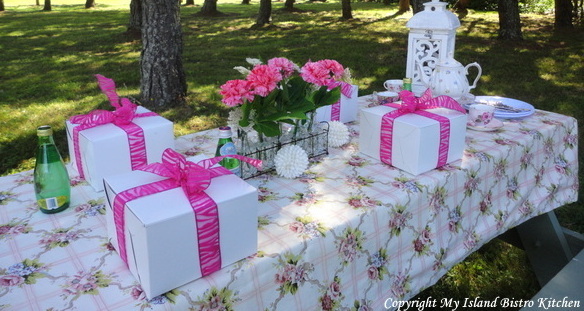 I hope you have enjoyed a glimpse into my pretty pink picnic today. Enjoy your day and have a great week ahead. I have always been a chocolate lover. 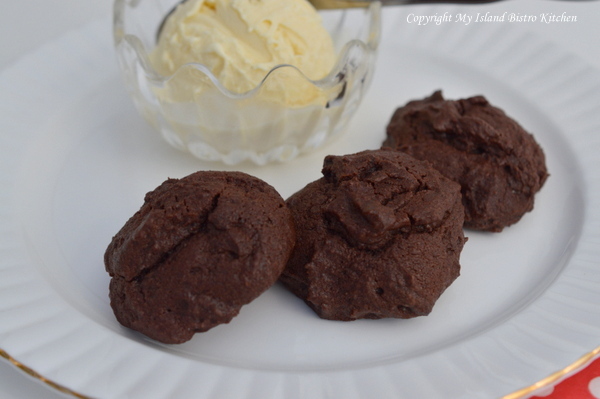 These chocolate cookies were ones my Mother often made when I was a child. I like the rich chocolate flavour and somewhat chewy center they have. 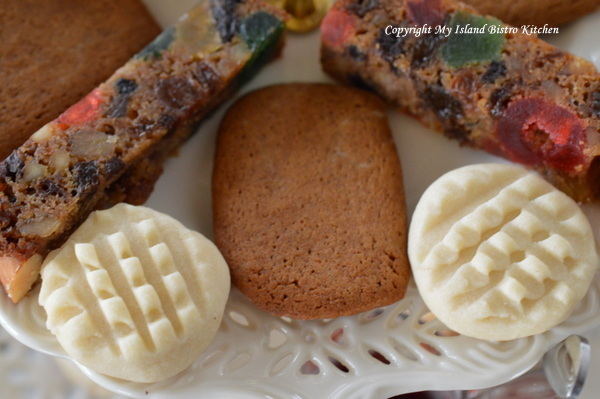 These cookies don’t take any uncommon ingredients or ones most bakers wouldn’t have in their cupboards. 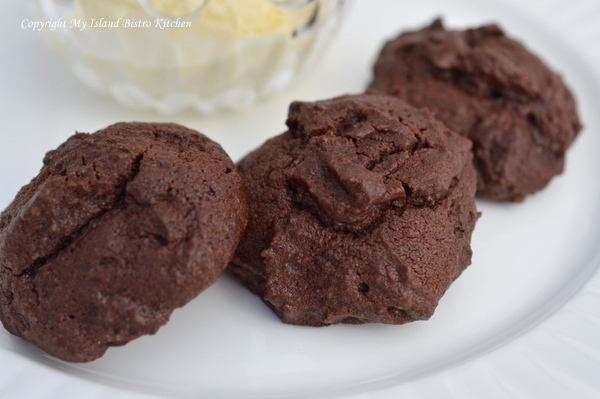 Of course, using the best cocoa you can find will make for a richer, more flavourful cookie. 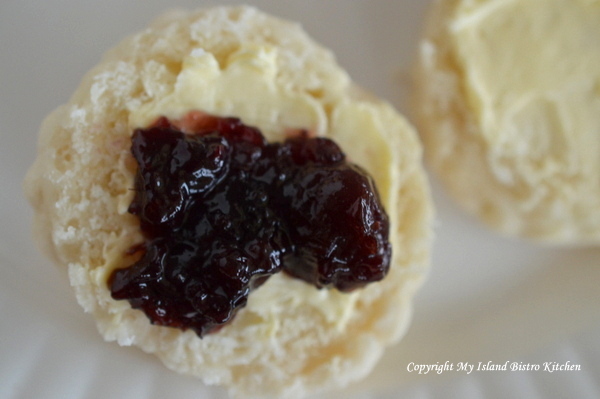 They are very easy to make and, being drop cookies, there is no rolling the dough and cutting out shapes and no need for any icing. 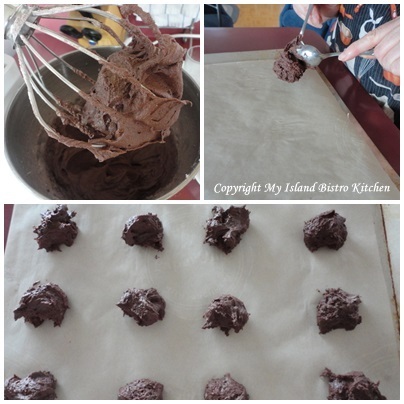 Simply scoop up some dough with a teaspoon and use another to slide the dough off the spoon and on to the cookie sheet. These cookies can be dressed up with 1/2 cup of either chopped nuts, dates, raisins, or even chocolate chips. However, I don’t add any extras to them as I like the smooth texture and flavour they have on their own without any further additions. 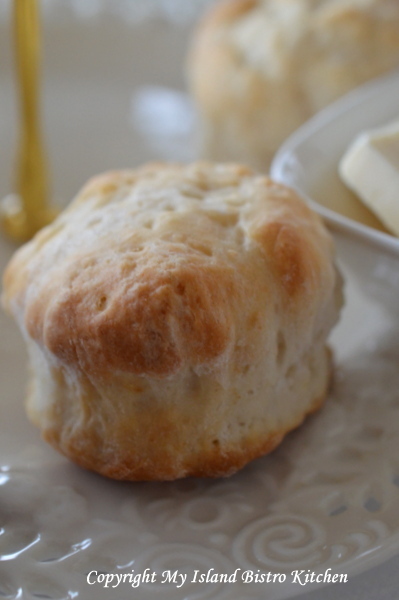 With electric mixer, beat shortening and sugar together until light and fluffy (1-2 minutes). Beat in egg, vanilla, and milk. Into separate bowl, sift together the flour, cocoa, baking powder, and salt. Add to wet ingredients and stir just until dry ingredients are incorporated. Drop by teaspoonfuls onto parchment-lined baking sheet. Bake 10-11 minutes. Do not overbake or cookies will be dry. 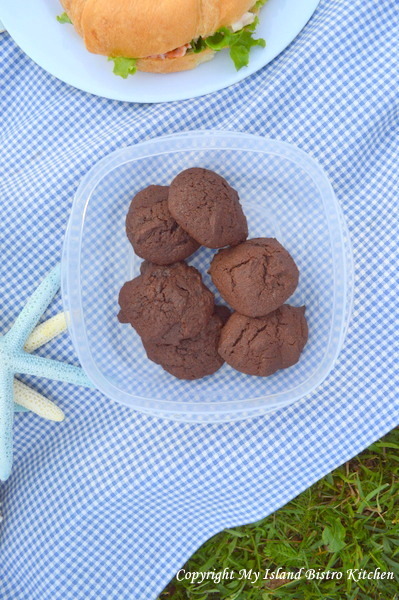 These cookies are good any time and make good lunch box treats as well as picnic basket fare. 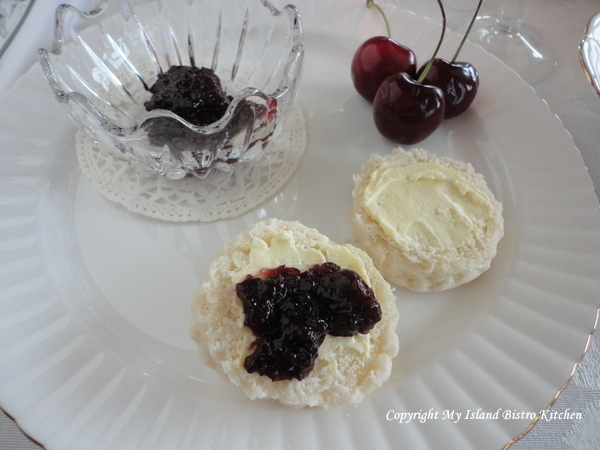 They are especially good with a dish of vanilla ice cream! My Sunday afternoon picnic today is a simple one. 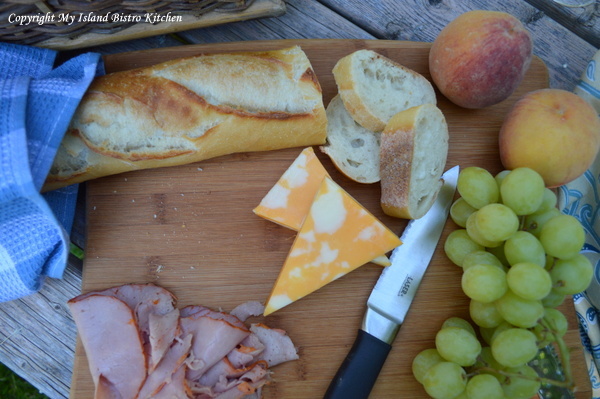 Not every picnic needs to be elaborate and involve a lot of food. This one would be considered a light refreshment type picnic, not a “full meal deal”. 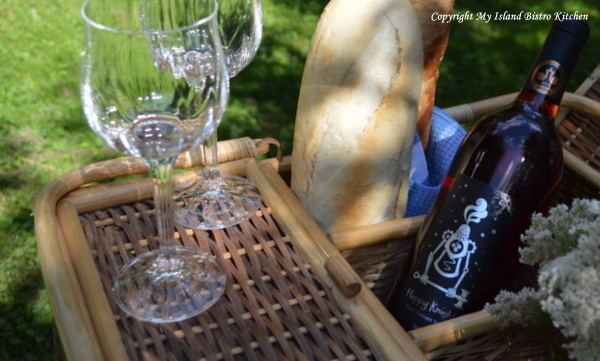 Really, all that is needed for this picnic is a good quality baguette, some cold cuts, tasty cheese of your favorite variety, grapes, and a good wine. I also brought along some fresh peaches because they are so vine-fresh and tasty this time of the year. You don’t even need a table for this kind of picnic. Here, an old rustic wooden bench serves the purpose. Of course, a couple of cloth placemats and napkins will always dress up any table….even if it is just an old wooden bench! 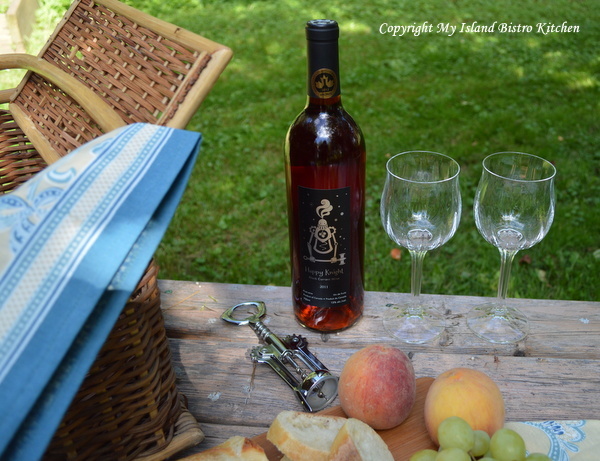 I chose a black current wine produced by Happy Knight Wines in Hatfield Pt., New Brunswick. I discovered this fine wine at PEI’s New Festival of Wines this past spring. We have a growing number of small wineries that are producing some mighty fine quality wines in the Maritime provinces. 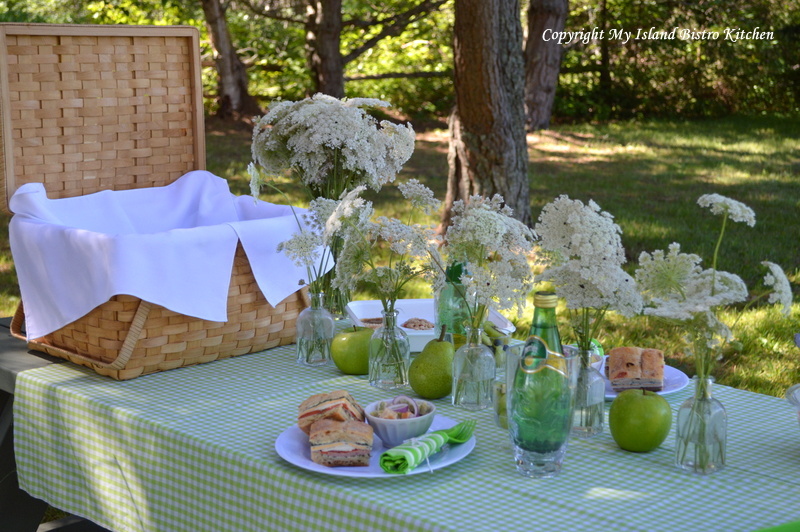 I love the configuration of this large picnic basket. In the center are three slots which easily hold the bread, the bottle of wine, rolled placemats and napkins, and a posy of wild flowers. There are two covered side holders for the food, dishes, cutlery, and glasses. The manufacturers of this basket knew what they were doing when they designed it! Find a nice quiet, relaxing spot on a warm summer late afternoon for the picnic. I hope you have enjoyed coming along on my Sunday afternoon picnic today. 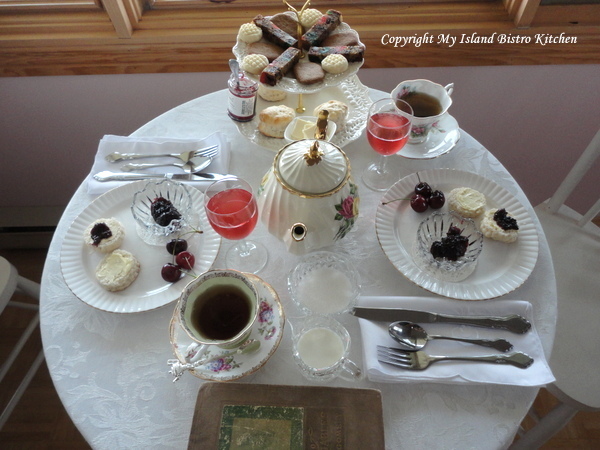 On this beautiful warm, sunny Prince Edward Island day, I am sharing a simple tablescape for teatime with you. 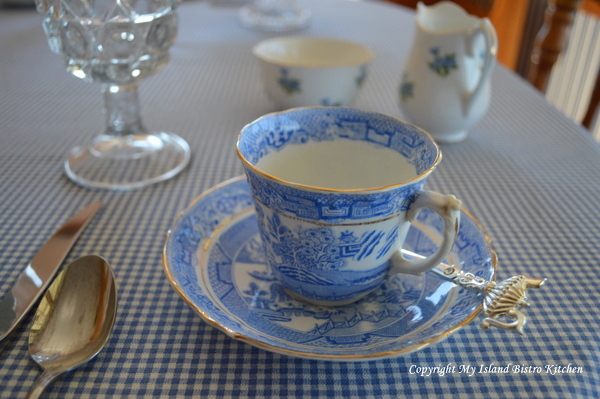 I have a three-piece setting of a very old blue tea set. It has no markings on it to tell me anything about what kind of china/porcelain it is or where it was made. If any of you recognize the pattern/manufacturer, please do let me know. 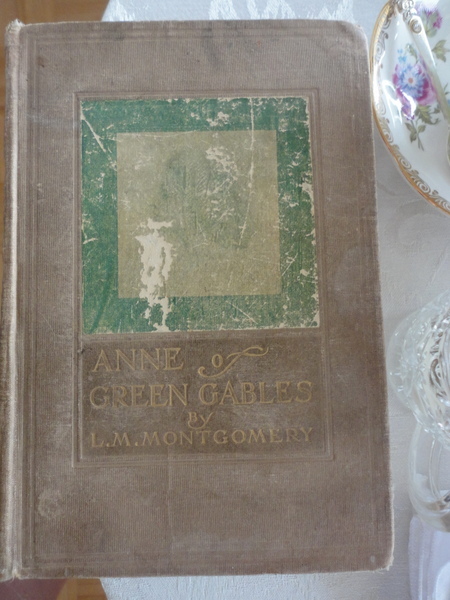 It is very delicate and a cherished set to own. 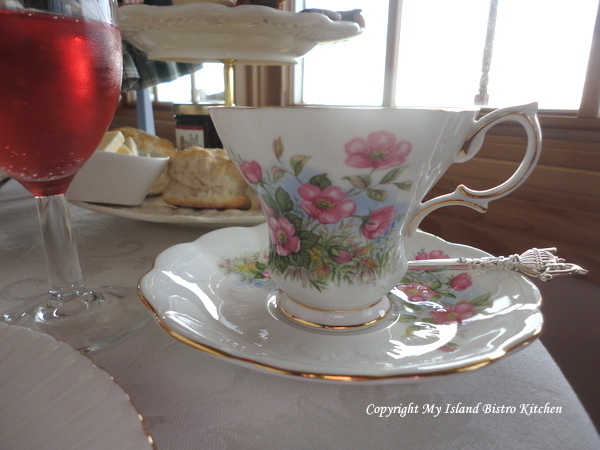 I love both the daintily-designed teacups and their shape. 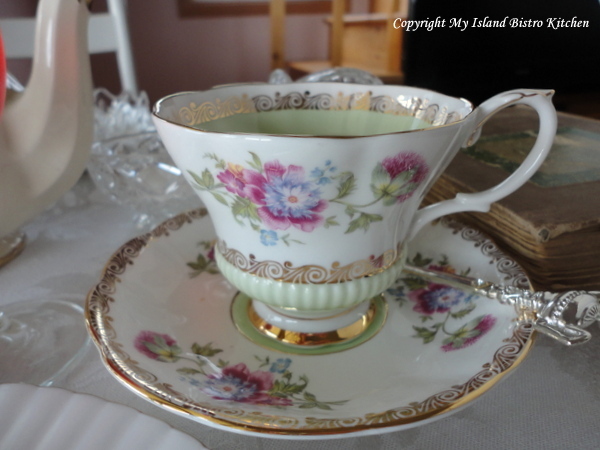 I imagine some Victorian ladies enjoying their afternoon tea with this tea set. 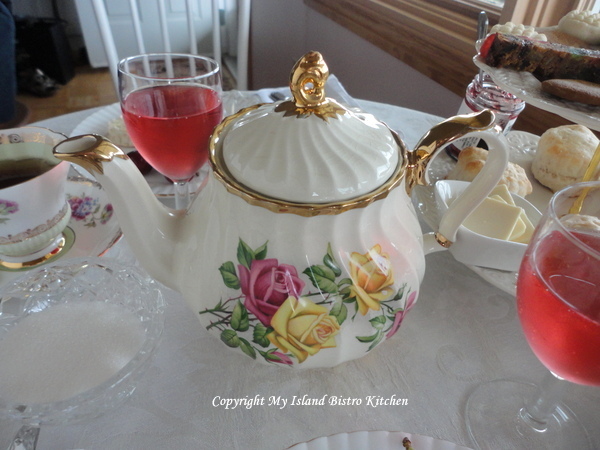 My choice of teapot for today’s tea setting is one that has tiny flowers of several different colors. 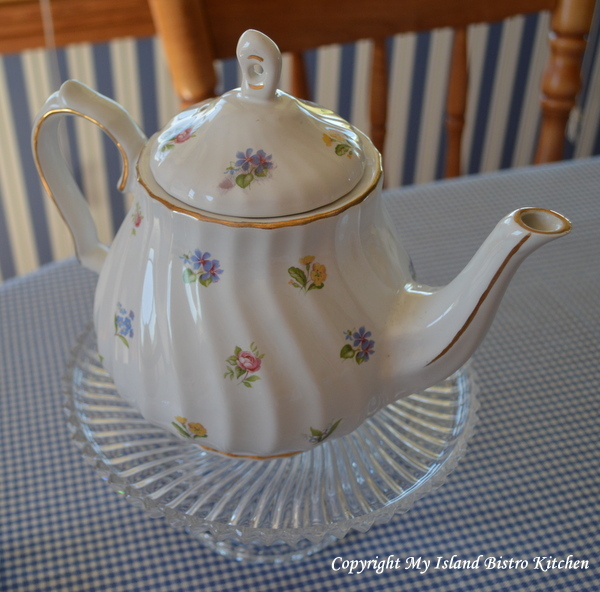 It is my go-to teapot for tea settings when I don’t have a teapot in the specific color of the dishes I am using. 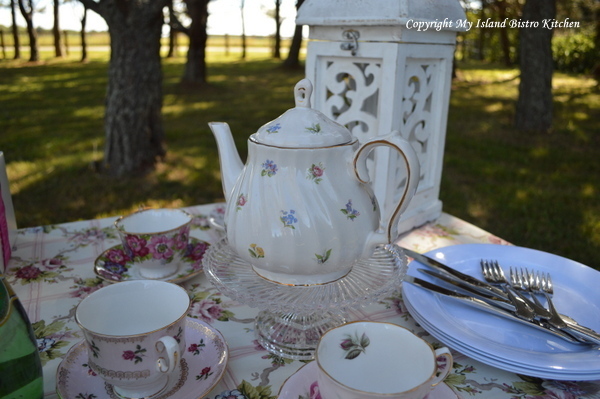 It is a versatile teapot because it is of no particular predominant color. 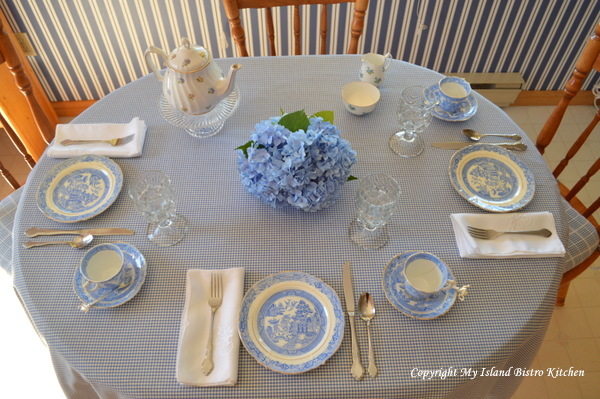 We have a wonderful blue hydrangea bush that blooms prolifically at the back door of the cottage so I thought two or three of the magnificent blue blooms would make a lovely centerpiece that would compliment the tea set. 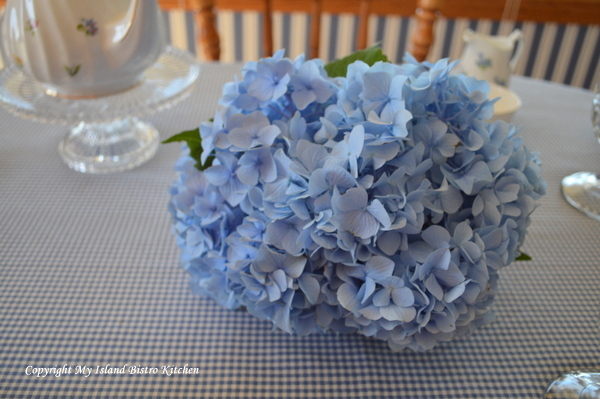 The hydrangea are actually in a small square vase even though they look like they are just lying on the table! 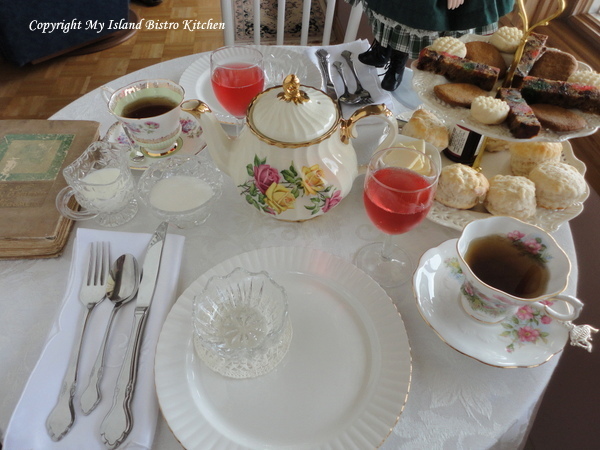 I felt the tea set was elegant enough on its own that it really needed no further adornment on the table other than the blue hydrangea centerpiece. I am belatedly joining Sandi’s Teatime Tuesday event at Rose Chintz Cottage this week. 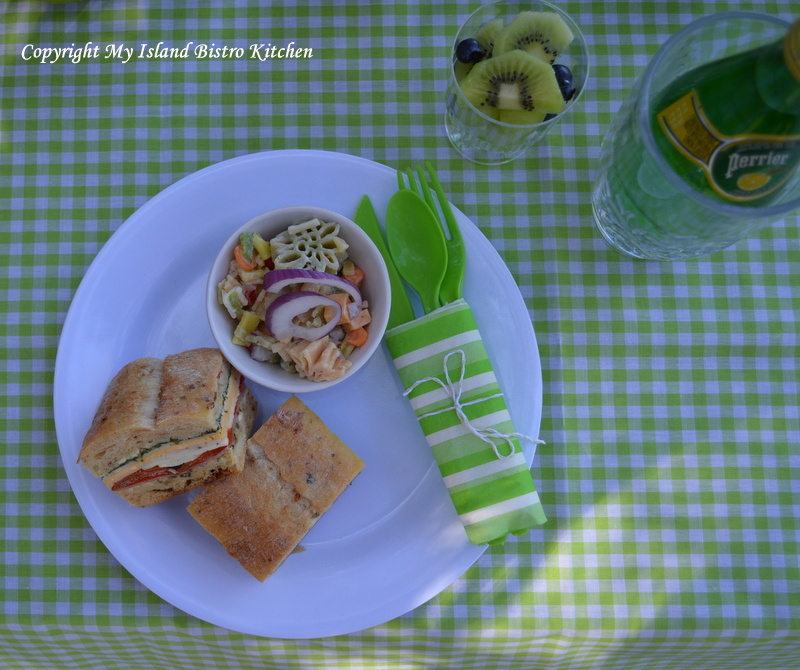 Those of you who follow my blog regularly may recall that I mentioned in my last posting about picnics that you don’t have to leave home to have a picnic. To prove this point, I decided to have a picnic supper this evening out on the front verandah. 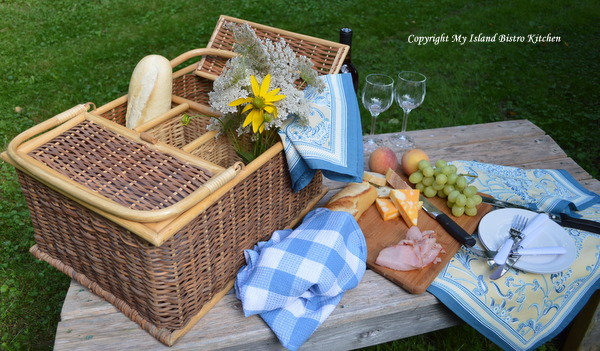 There are advantages to having a picnic at home — for example, you can use regular dinnerware, glassware, and cutlery (not that you can’t when you pack a picnic basket but most of us tend to use the unbreakables for offsite picnics). You are handy to the fridge and cupboard so don’t need to worry about forgetting to pack something when going off on a picnic. The menu can be more extensive…particularly if part of the meal involves cooking and hot foods. 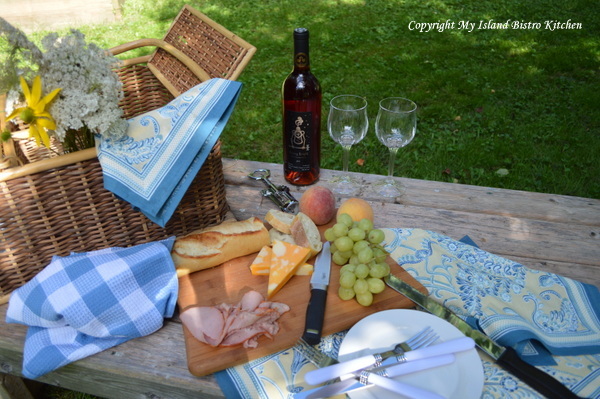 And, of course, a picnic at home can be spur-of-the-moment with no advance planning — so long as the weather is cooperative, a picnic on the verandah or back deck is do-able. To start, I decided I would go with a bistro theme, using one of my favorite plaid tablecloths and then choosing the coordinating colors from it — the yellow flowers, the peaches, and so forth. 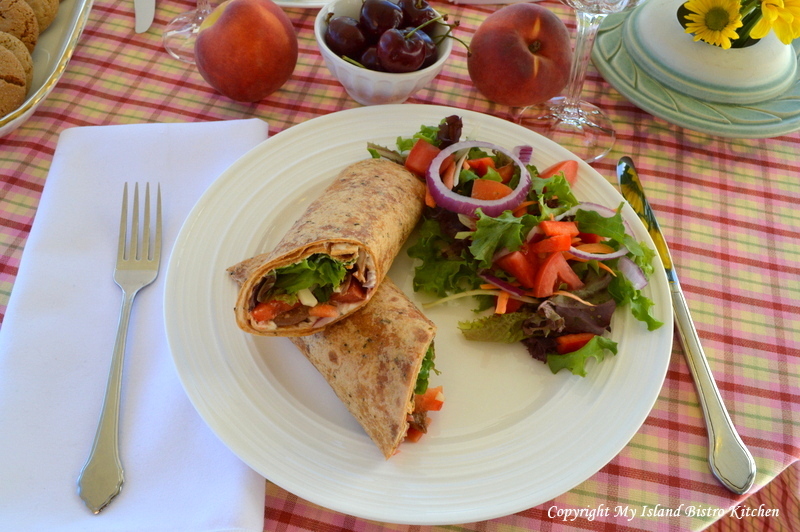 For the main course of the picnic, I chose chicken and veggie wraps (recipe follows) and a garden salad which I paired with flipflop Pinot Grigio wine. 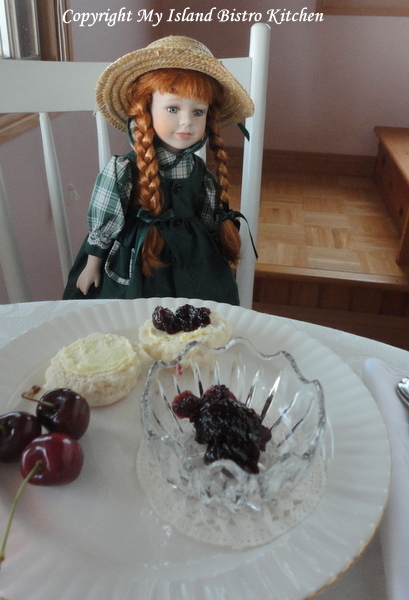 And, for dessert, ginger cookies and for fresh fruits, in-season peaches and sweet cherries. Nice, easy, and tasty Saturday evening summer meal. I love all the fresh veggies available this time of the year….and how colorful they make a plate! 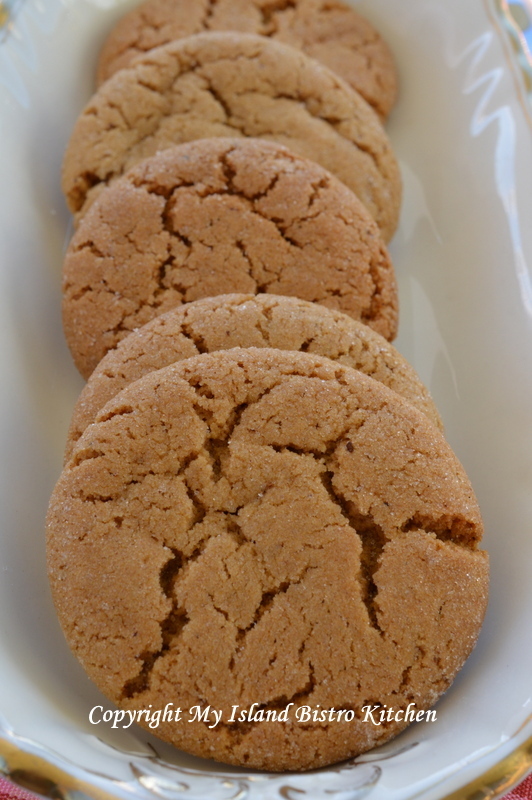 Ginger cookies are always good, no matter what time of the year it is! 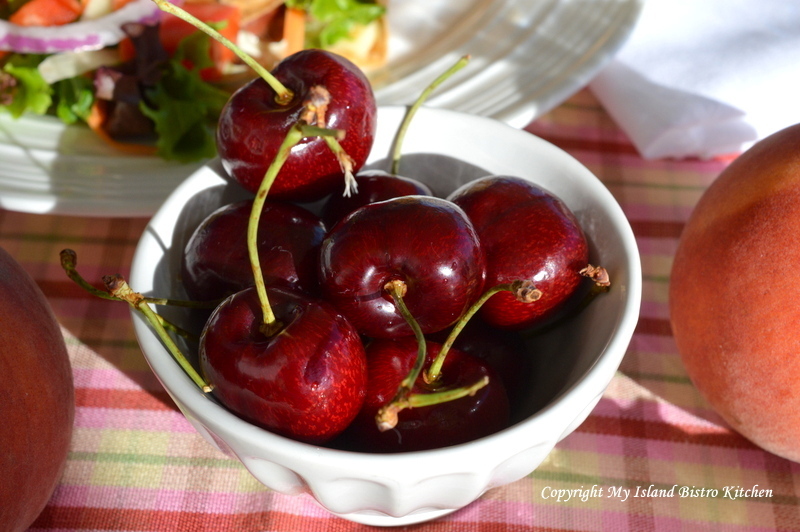 I always try to include fresh seasonal fruit in my picnic menus. 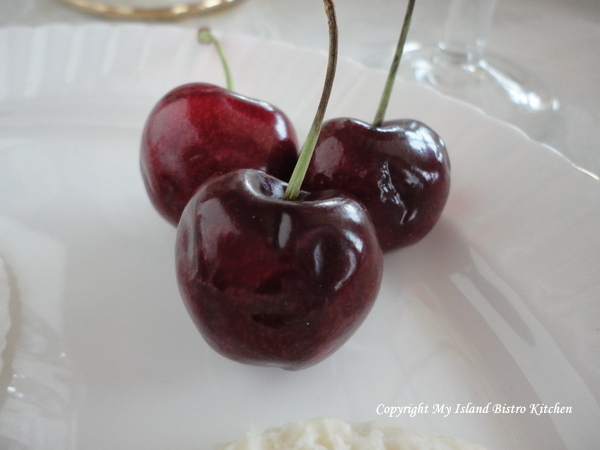 Peaches and cherries make a lovely pairing. Chop one small-medium sized chicken breast. Marinate in your favorite marinade for 3-4 hours (I use soya sauce, oil, brown sugar, garlic, and chopped onion). Remove chicken from marinade and stir-fry till cooked. Spread desired amount of cream cheese on each tortilla, leaving about 1″ edge around each tortilla. 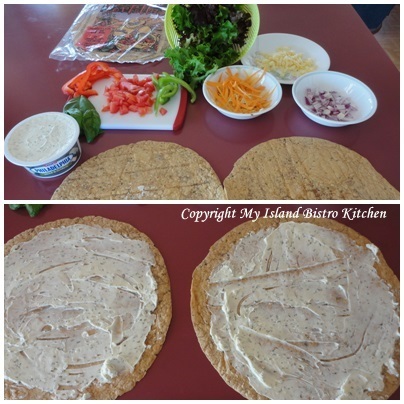 Along center line of each tortilla, place the remaining ingredients — peppers, tomato, onion, chicken, carrot, cheese, and lettuce. 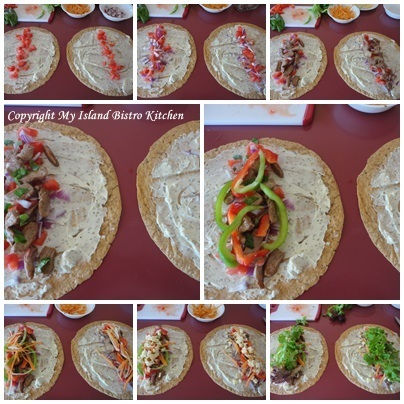 Roll up each tortilla, cut in half, and plate. 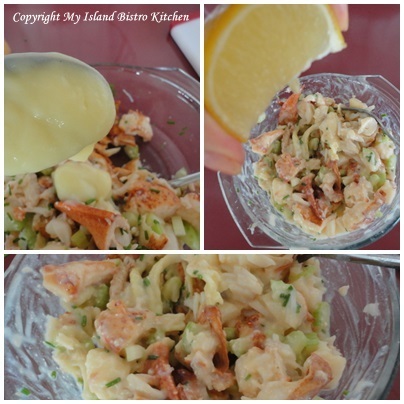 Have you visited My Island Bistro Kitchen’s new Facebook page yet? 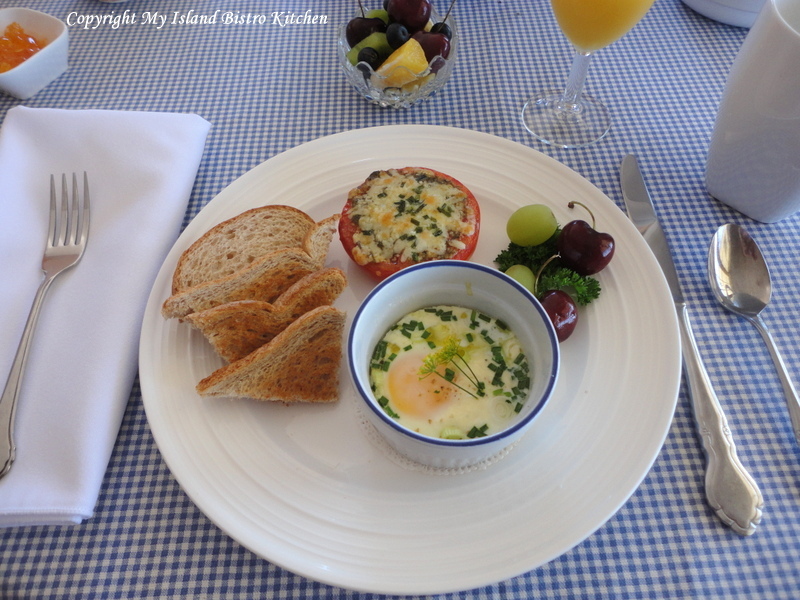 Why not head on over to Facebook and check out My Island Bistro Kitchen. Be sure to click on the “Like” button to receive notifications of new postings – if you place the cursor over the blue “Liked” button, a drop-down menu will appear. 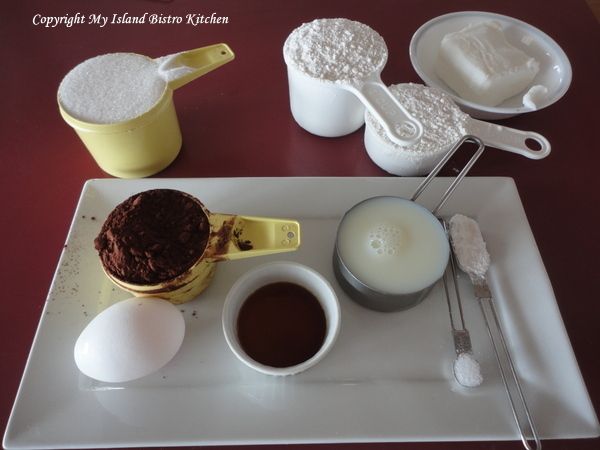 If you place checkmarks beside both the “Get Notifications” and “Show in Newsfeed” options, you should automatically be notified of new postings to My Island Bistro Kitchen Facebook page. I like picnics. 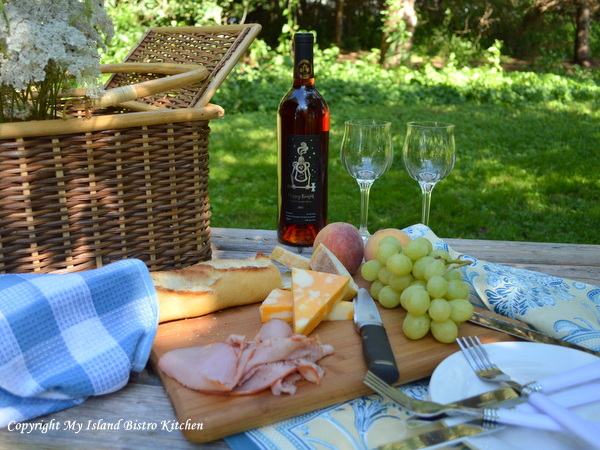 My earliest memories of picnics consist of Sunday family drives on the Island with a stop at a park for a picnic lunch. 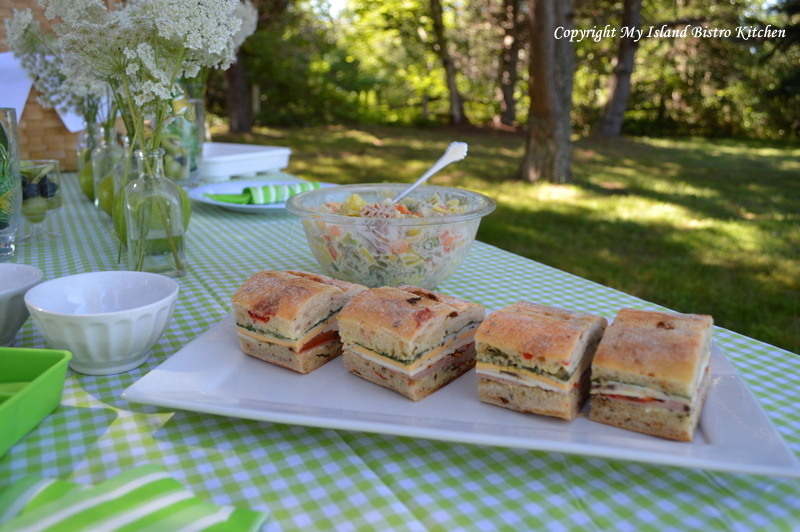 My Mom would have prepared the traditional picnic fare of tomato sandwiches along with ham and cheese sandwiches, too. These would have been packed up in the airtight Tupperware containers and placed in the old blue Coleman cooler with ice (I’ll bet some of you remember those coolers!). 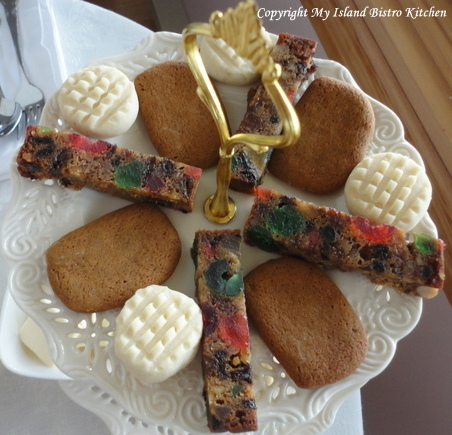 There would be cookies and squares for dessert. 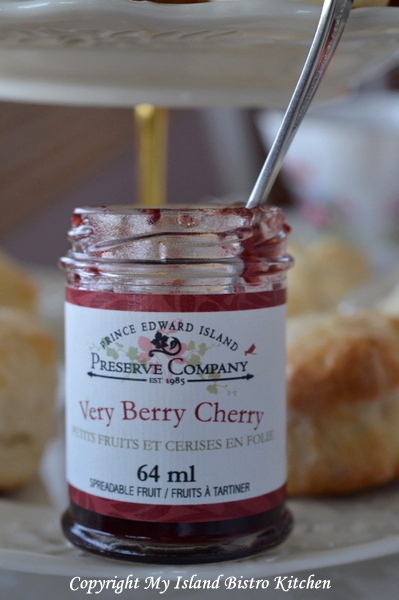 Often plums and pears would be included in late summer outings because that would be their “in-season” time on PEI. We had a large thermos that would have been filled with some kind of juice and lots of ice cubes and off we’d go touring around our province. 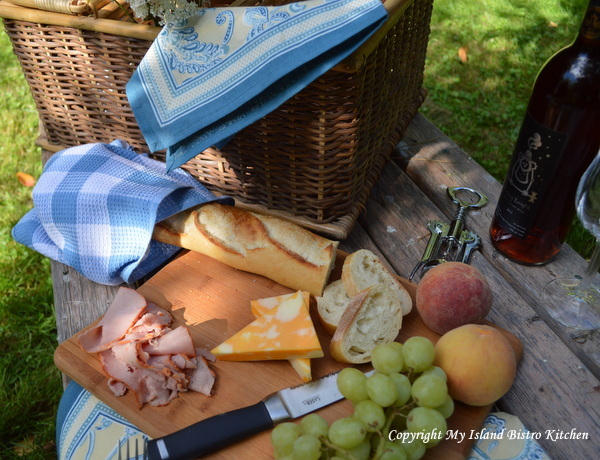 Picnic food always seems to taste so good …. whether it is the fresh air or what it is, I don’t know. It’s also a great way to casual dine. But that doesn’t mean it has to be boring or ordinary. 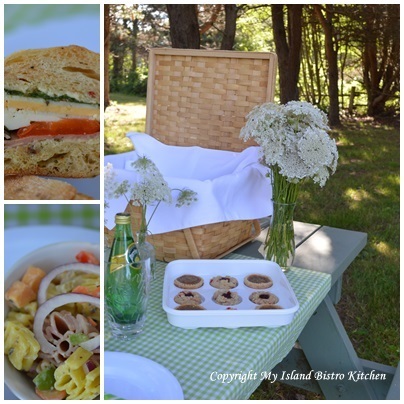 With a little planning, organization, and effort, picnics can be gourmet and they can be an event. 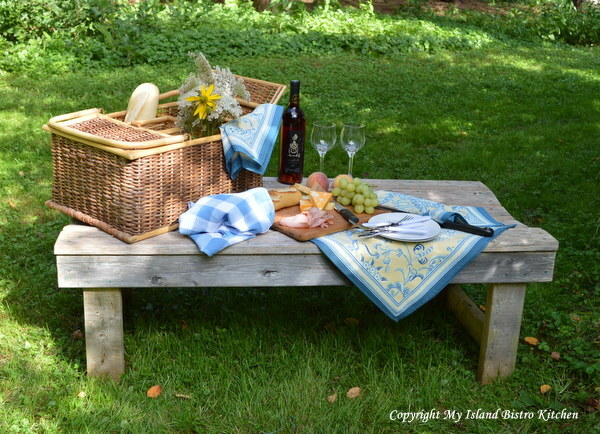 And, the best part is that you don’t even need to leave home to have a picnic! 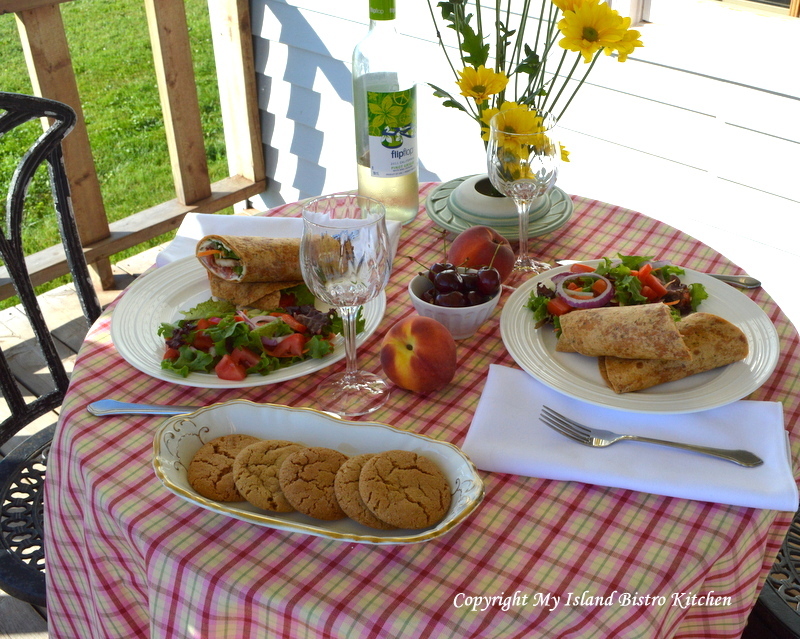 You can picnic right in your own backyard, on your front verandah, or on your apartment or condo balcony. 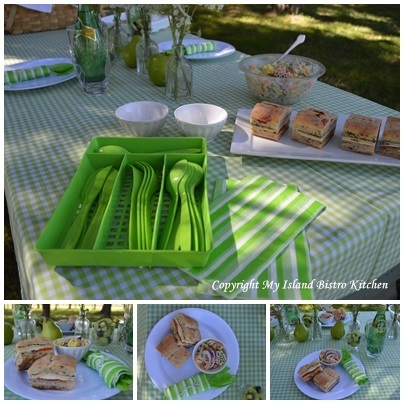 The color theme for today’s picnic is lime green with white accents. Just because we dine outside doesn’t mean we can’t add some polish to the dining table which, in my case today, just happened to be a traditional old wooden picnic table in a park. 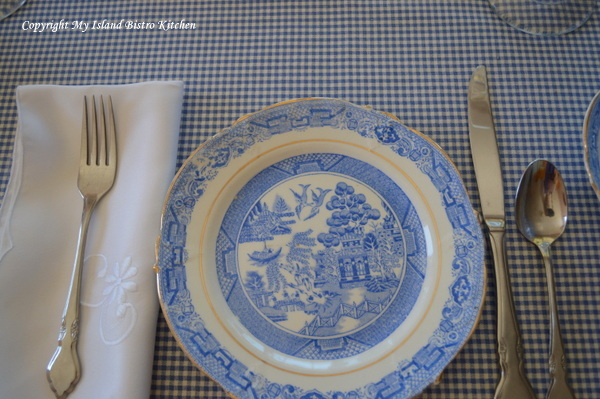 As those of you who regularly follow my blog will have heard me say before….you don’t need high-end dinnerware and cutlery for picnics. 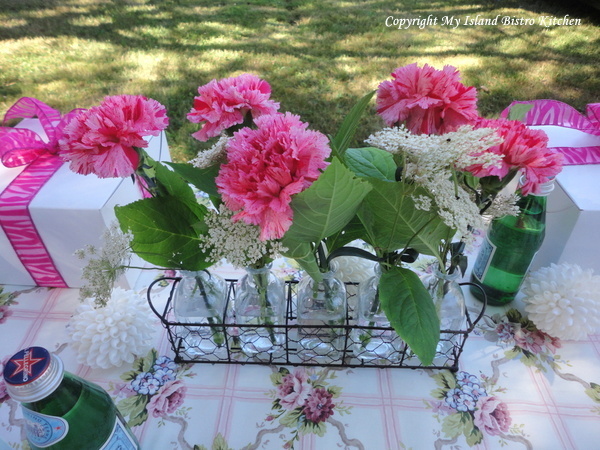 Simply visit your local dollar stores and you’ll find lots of things that will make your table look very dressy and you won’t have spent a fortune on the items. 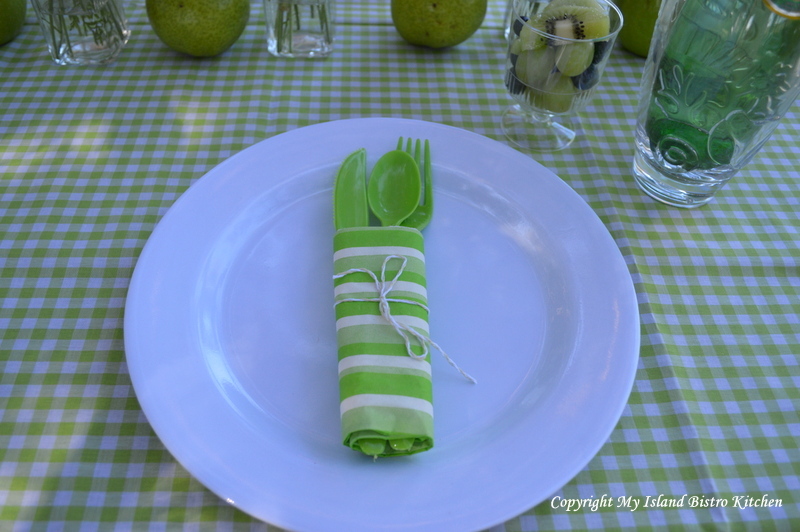 The white plates, napkins, lime-green cutlery, and small salad bowls I used today all came from my local dollar store. I debated about what flowers to dress the table with but knew I wanted them to be white. 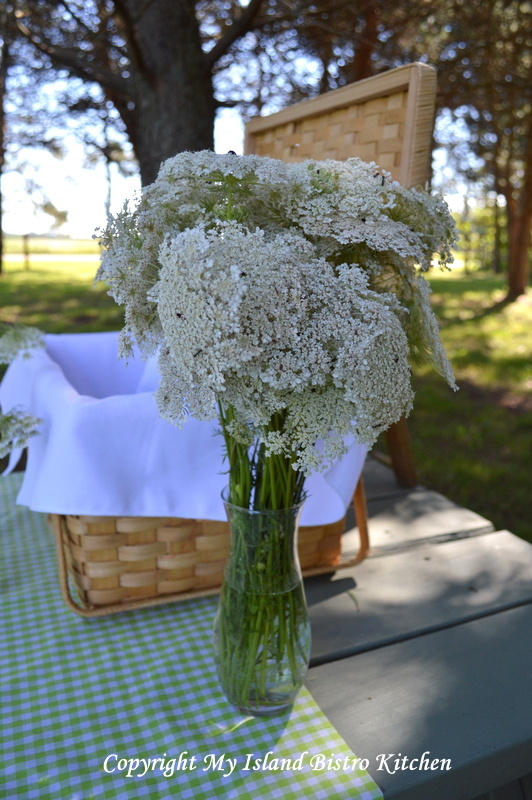 Queen Anne’s Lace blooms prolifically on PEI this time of the year so I stopped on the country roadside on my way to the park and claimed some Queen Anne’s Lace from the ditch. 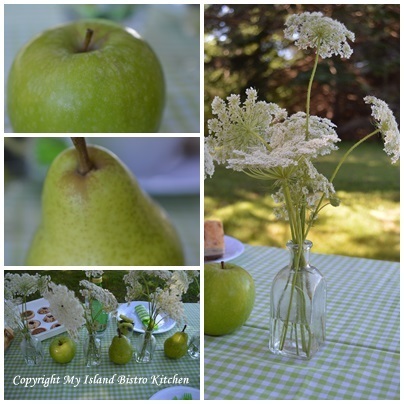 I added some green Granny Smith apples and green pears and, voilà, I had an easy, carefree centerpiece that took the picnic table from blah to one that looks attractive and oh-so-summery. You don’t need to spend a lot on tablesettings for it to look attractive and, bonus, the apples and pears can be part of the meal! 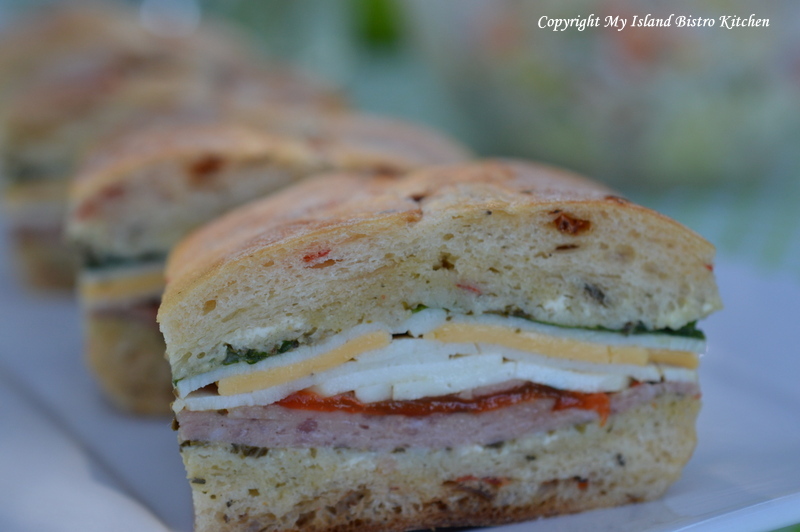 For my picnic outing in the park today, I am highlighting pressed Italian sandwiches. 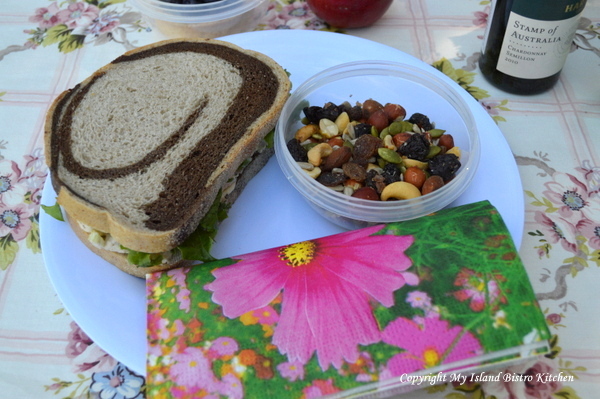 While my Mother would have gone to take great pains to ensure the picnic sandwiches were carefully packed so they would not get squashed, I actually purposely squashed mine today! 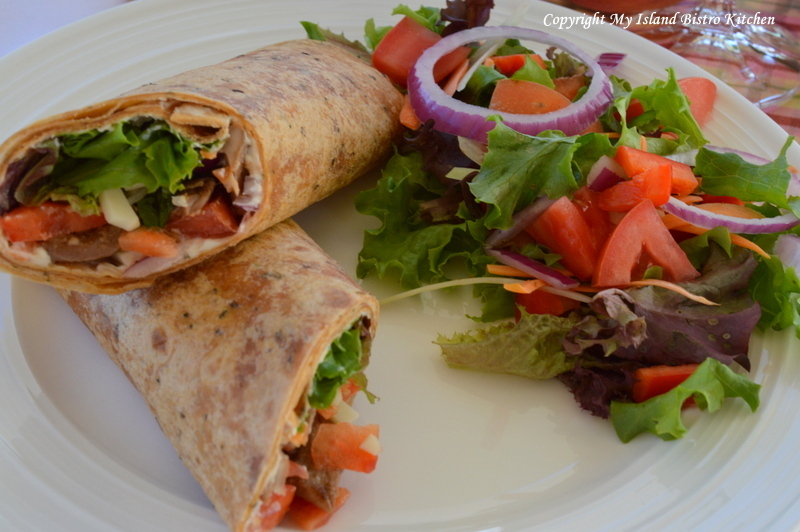 These sandwiches are incredibly tasty, not as difficult to make as you might think, and they look so attractive on the plate. 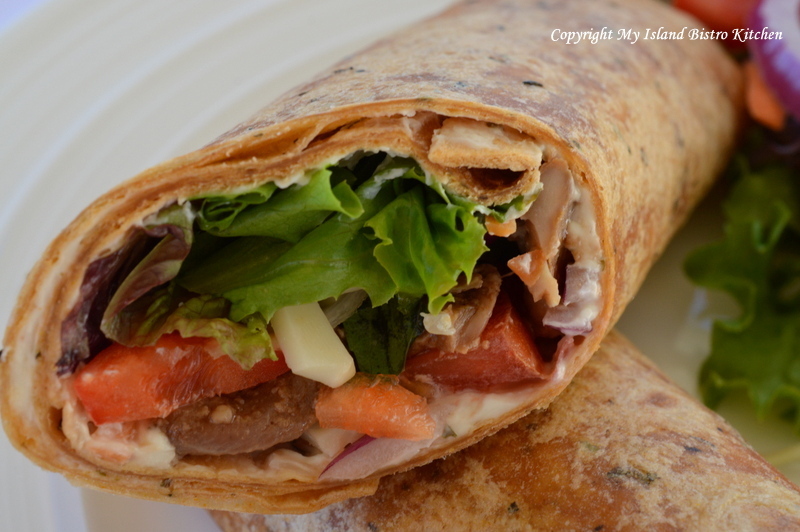 The idea of pressing the sandwich is that it helps all the flavours to blend. You will need to press the sandwich for several hours or overnight. The recipe for these sandwiches follows at the end of this posting. Make sure you use a good quality bread for this sandwich and one that is not too soft. Here, I have used a Ciabatta. 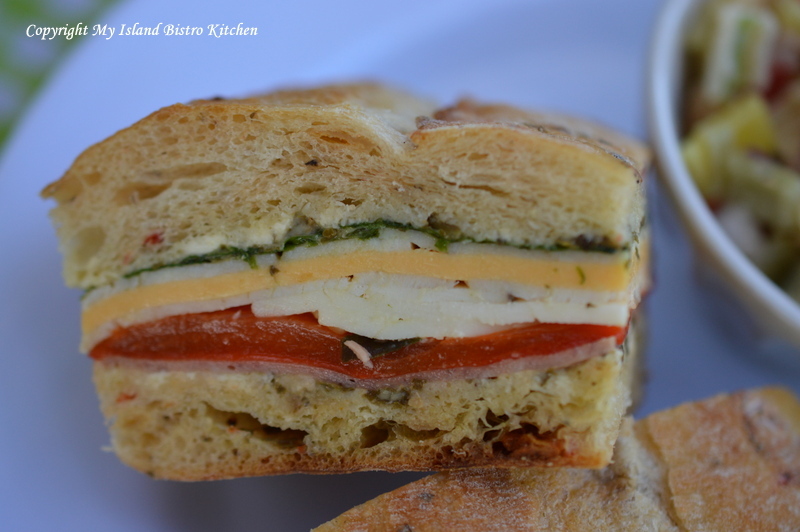 I love the ribbons of color that the sandwich ingredients make! 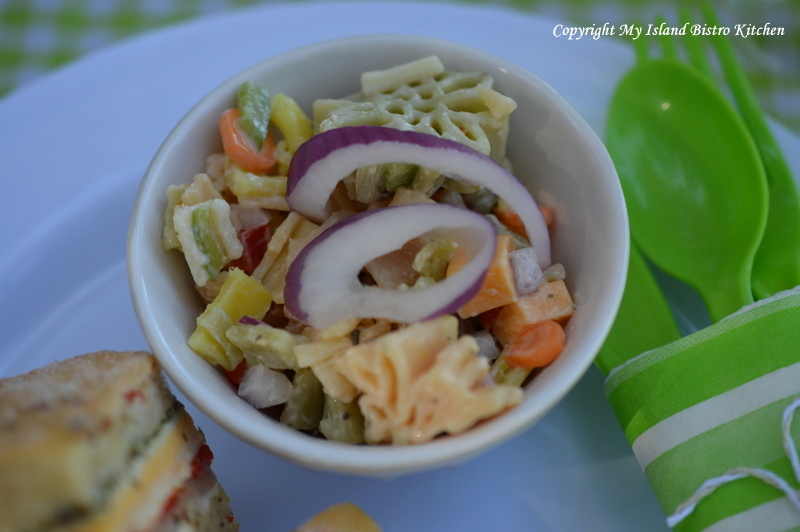 As a side dish, I chose to serve a pasta salad. I found a great bag of colored, flower-shaped pasta at our local Winners store and I thought it would be great in a pasta salad which it was. 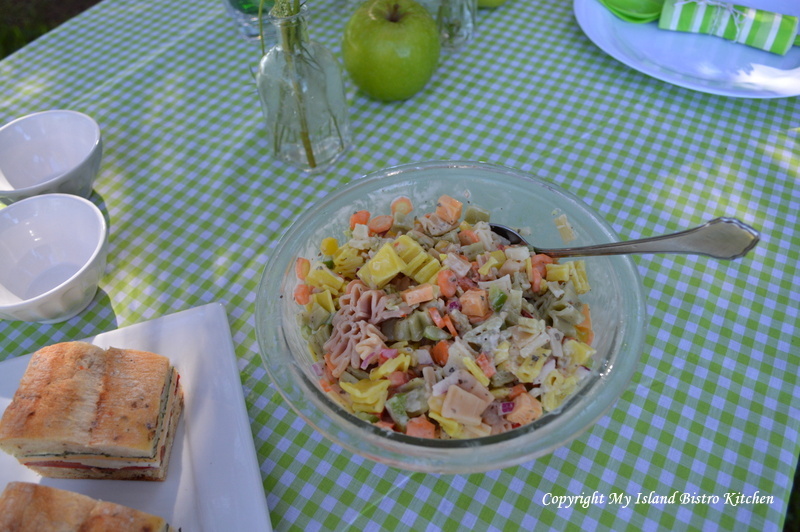 Pasta salads are easy to make and travel well – that’s probably why we often see them making an appearance on picnic menus. 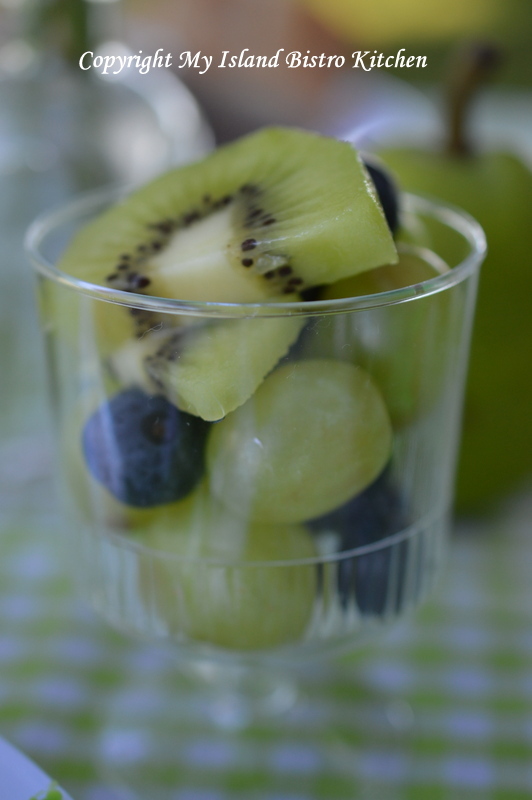 Dessert consisted of a small fruit cup of green grapes, kiwi, and blueberries….again, the focus was on green with the blue for contrast. 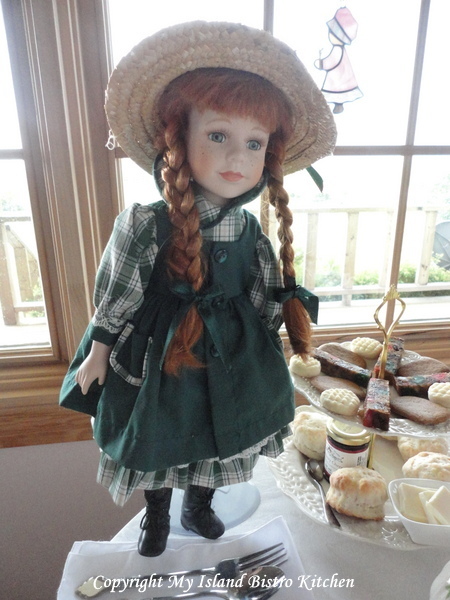 Of course, there always has to be something for the sweet tooth on the picnic menu! 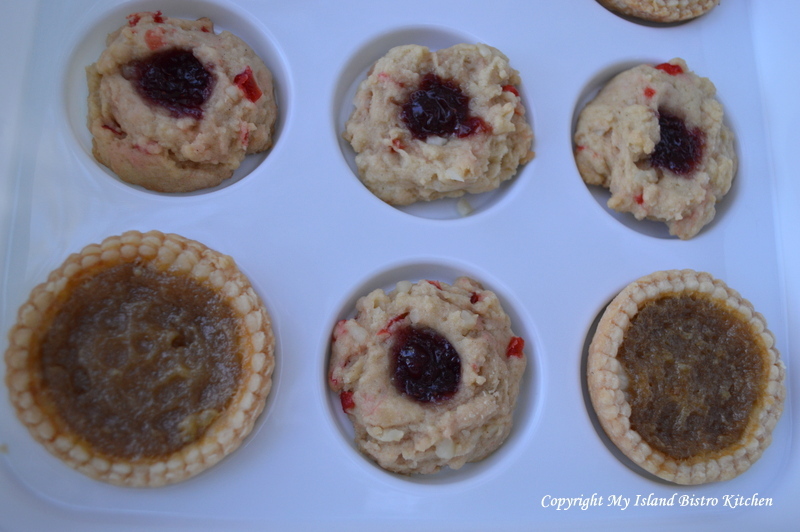 I used my dollar store cupcake carrier for the Jam-Filled Brown Sugar Cookies and the butter tarts. This proved a good way to transport them and keep them in place. And, when it all got pulled together, this is what it looked like. Can you taste those good Italian cold cuts in the sandwich! 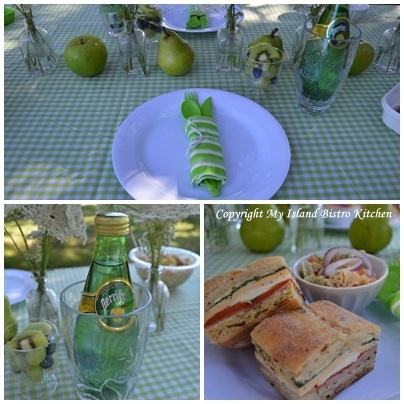 Now, here are some collages of today’s picnic. 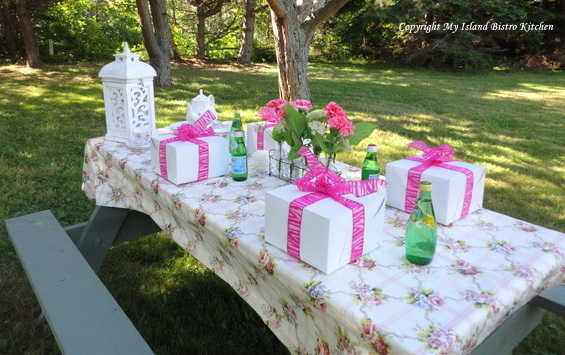 Keeping color schemes simplistic makes the picnic table look coordinated. 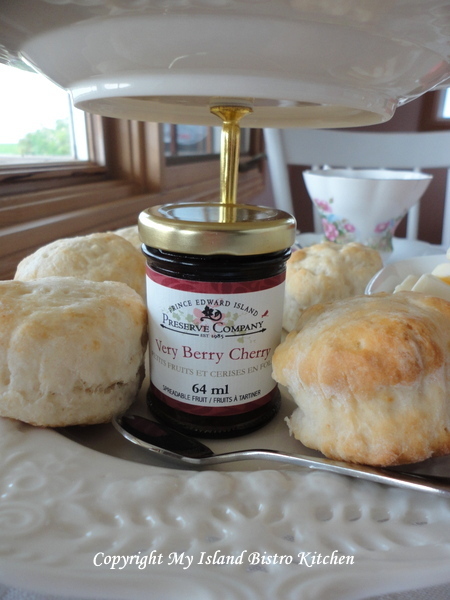 A tasty meal, for sure on a warm PEI summer day! 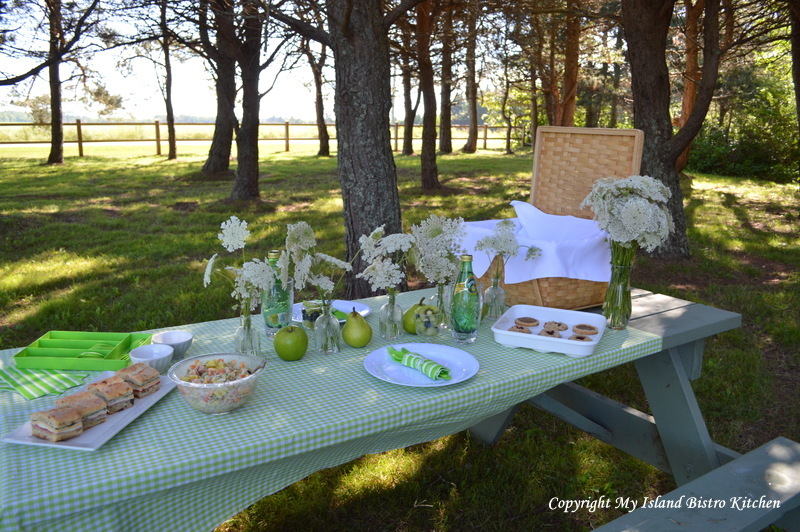 PEI offers many great venues for picnic lunches, from our parks to our beaches. I like to include edible components to table centerpieces. 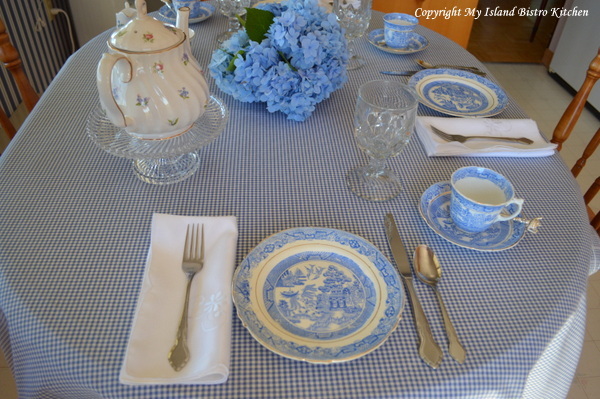 Using wildflowers in the tablesetting is a great way to enjoy local flora. Mix and match patterns (e.g., checks and stripes) for interest but just keep them in the same color family. I love how the sun peaked through the trees. I am going to look at these picnic photos some day in cold January and try to remember what a beautiful day today was for a picnic. 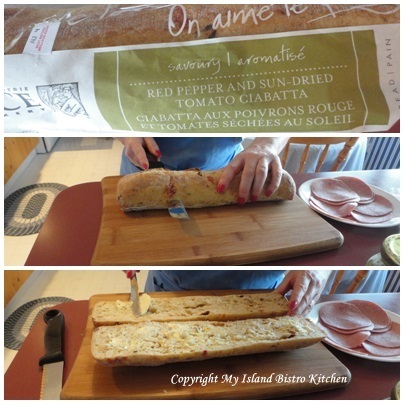 Slice bread in half, lengthwise as shown in photo below. Butter both sides of bread. 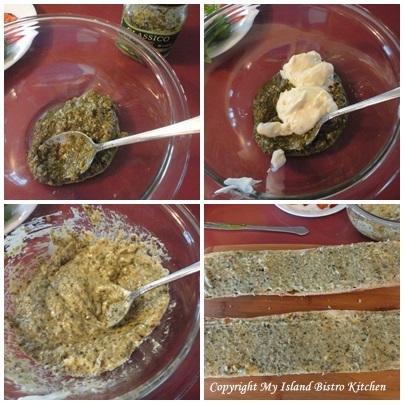 In small bowl, mix about 3 tbsp pesto with about 1 – 2 tbsp mayonnaise. Spread on both sides of bread. On bottom half of bread, add a layer of salami, followed by the roasted red pepper. Add torn pieces of basil leaves. Add a layer of Provolone cheese. Add a layer of turkey breast. Drizzle just a bit of olive oil, about 1 tsp or so, over the turkey breast. Add a layer of cheddar cheese followed by a second layer of turkey breast. Add fresh leafy lettuce and drizzle a bit of your favorite balsamic vinegar, about 1 tsp, over the lettuce . 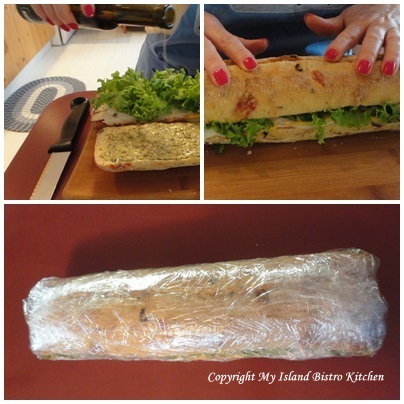 Place the top half of the bread on top of the sandwich ingredients and press down on the sandwich. Wrap entire filled loaf of bread as tightly as possible in plastic wrap. Place in refrigerator and place a weight on top of the sandwich to “press” it. This could be a couple of heavy books, for example, or anything that will press the sandwich down. Let this rest in the refrigerator overnight or for at least 4-5 hours to let the flavours blend and to ensure that the sandwich is pressed. Remove the sandwich from the refrigerator. Remove the plastic wrap. 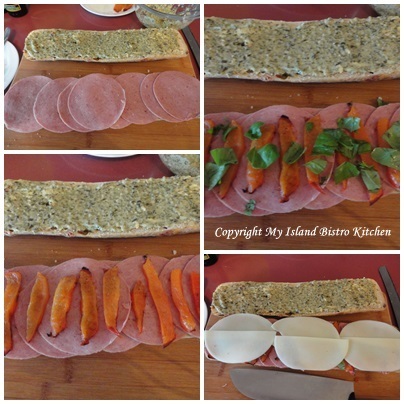 Cut into desired widths of individual sandwiches. Out of this size of loaf, I got six sliced individual sandwiches. For presentation, I also like to cut off the outside edges all around the sandwich loaf as it makes it more even and tidy and the layers of the sandwich are more visible.